Strawberries are considered as ‘the queen of fruits’ in Asian nations as it provides a lot of nutritional and health benefits. 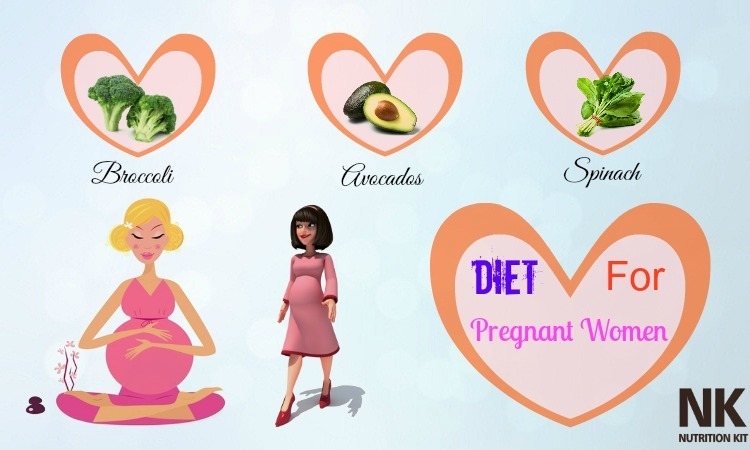 These juicy heart – shaped fruits have much more to offer beyond their attractive fragrance and sweet flavor. In fact, we can call strawberries “superfoods for health”. Many people love strawberries and use them as a common cooking material. If you love strawberries, then you should grow these plants right in your garden and enjoy these powerful fresh little heroes right at the comfort of your own home. 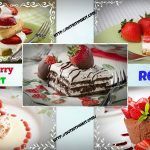 There are many tasty and healthy strawberry dessert recipes that you can learn and make at home on a regular basis as well. 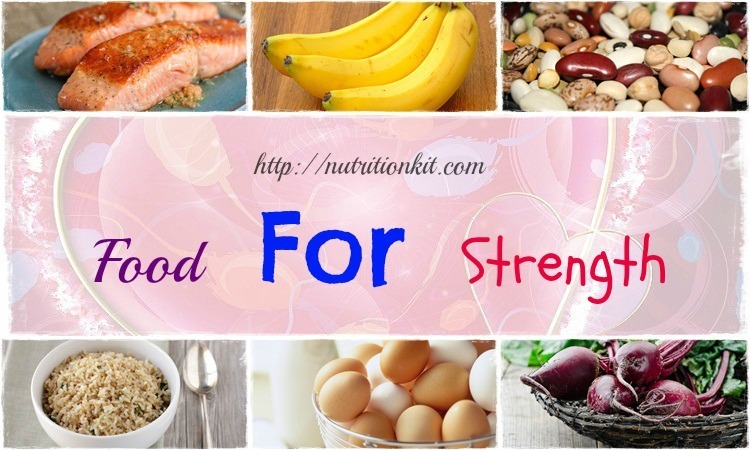 Thus, keep both of your eyes on the list of the best strawberry dessert recipes on the section Recipes of the Nutrition Kit site. 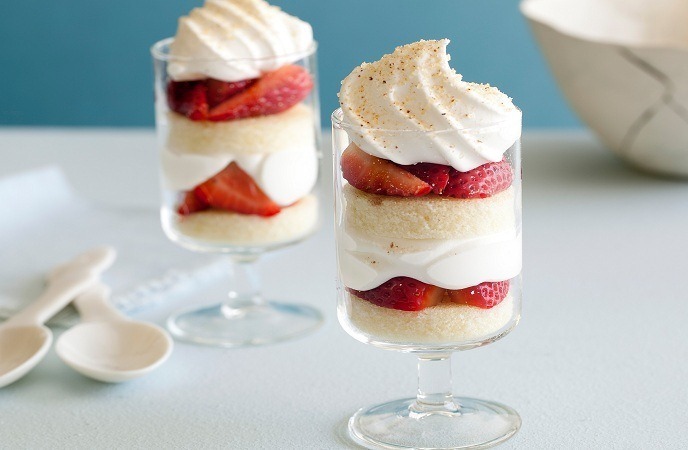 Angel food pieces would be topped with whipped topping, sweetened cream cheese, and strawberries in glaze in this layered, chilled dessert. Crumble the cake into a 13×9 inch dish. Beat the sugar and cream cheese in a medium-size bowl until fluffy and light. Fold in whipped topping. Mash down the cake using both two hands and spread over the cake with the cream cheese mix. 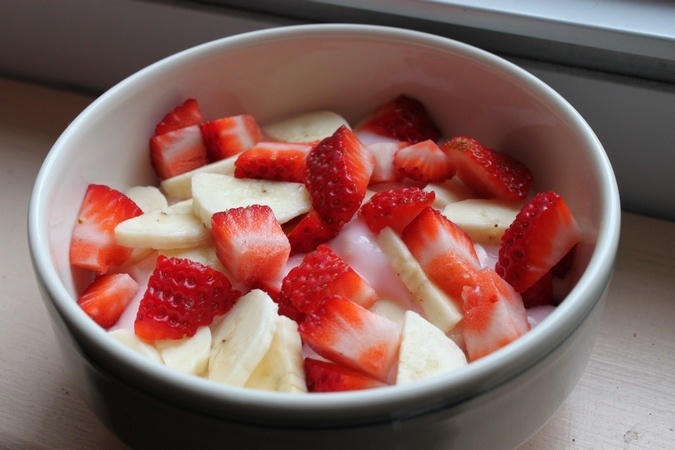 Mix glaze and strawberries in a bowl till strawberries are coated evenly. Spread a cream cheese layer over. Chill till serving. This is a family recipe that everyone may like a lot. It is indescribably tasty! Mix melted butter, 1/4 cup sugar, and graham cracker crumbs in a medium bowl till all ingredients are blended well. Press the mixture into the bottom of a 13×9 inch pan. While making the filling, chill the mixture in a freezer. Beat 1/4 cup sugar in cream cheese and 2 tbsps. milk in a large bowl till you get a smooth mixture. Fold in half of the whipped topping you prepared before. Spread the filling over crust. 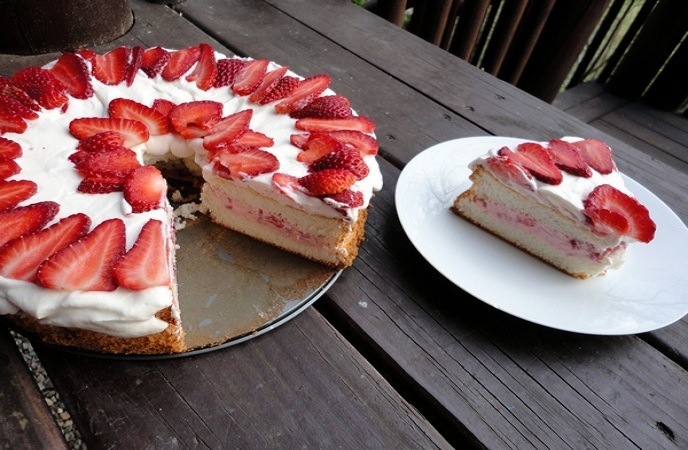 Put all strawberries over the filling in an even layer. According to the direction on the label, prepare instant pudding but just use 3.5 cups of milk. Spread the pudding you prepared over all strawberries. Chill the mixture within about four hours at least, or you can also leave it on overnight. Spread the rest of the whipped topping over your pudding before you serve the dish. 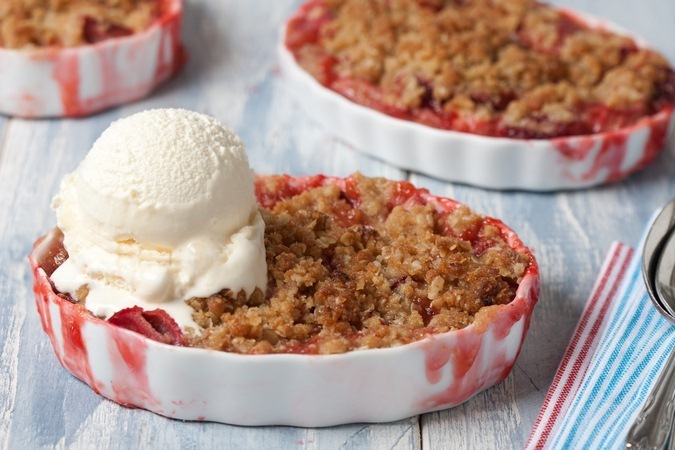 This is actually a creamy strawberry dessert topped with a tasty crumb topping. Stir the melted butter, walnuts, brown sugar, and flour together in a bowl. Spread out on a baking sheet. In the preheated oven, bake the mixture in twenty minutes till it turns crispy, and then take it out of the oven and let it completely cool. Beat the egg whites for softening the peaks; keep beating till the egg whites reach stiff peak level while adding sugar slowly. Toss in the lemon juice with strawberries, and stir into the egg whites till you get a slightly pink mixture. Fold in the whipped cream till completely incorporated. Crumble up your walnut mix, and sprinkle two third of it on a 13×9 inch dish’s bottom evenly. Spoon the strawberry mix over the crumbs, and then use the rest of the crumbs to sprinkle over top. Put it into a freezer and freeze within 2 hours till it turns solid. Take it out of the freezer for a while before you serve it so that you will be able to slice it with more ease. This is a nice change from strawberry rhubarb pie and your family will definitely love it a lot! Preheat oven to 175 degrees C (350 degrees F). Grease a 13×9-inch baking dish. Whisk 2 tbsps. of sugar and 2 cups of flour together in a bowl; cut the butter using a pastry cutter into the mix of the flour till the mix resembles coarse crumbs. Press the crust up the sides and into the bottom of the baking dish you prepared before. In the preheated oven, bake the crust till it is lightly browned, within about twenty minutes. 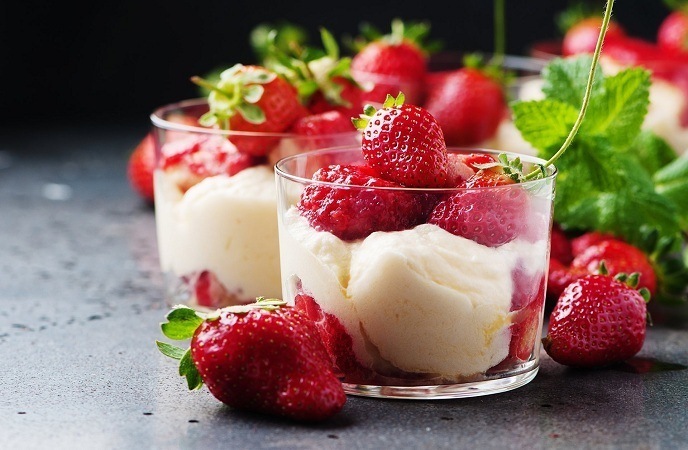 Mix cream, egg yolks, salt, 1/3 cup of flour, and 2 cups of sugar together in a large bowl till all ingredients are well-blended; stir in the strawberries and rhubarb. Pour the filling into the crust you have baked before. Put the dish back to the oven, and bake within 50 – 60 more minutes or till the filling is set. Meanwhile, put the cream of tartar and egg whites into a large-size mixing bowl, and use an electric mixer to beat on medium-high speed till the egg whites reach the soft peak level; beat in 3/4 cup of sugar gradually till you get a glossy, stiff peak mixture; add vanilla extract and beat well. 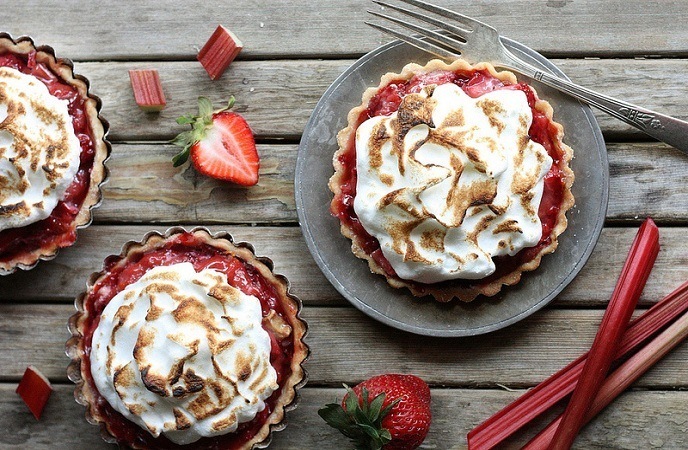 Take the dish off your oven, and use meringue to top. Keep lifting and swirling the spatula to make decorative swirls and peaks. Put it back to the oven and keep baking within about fifteen minutes more or till the meringue gets the pale golden brown color. Allow the pie to cool to room temperature, and then serve it chilled. 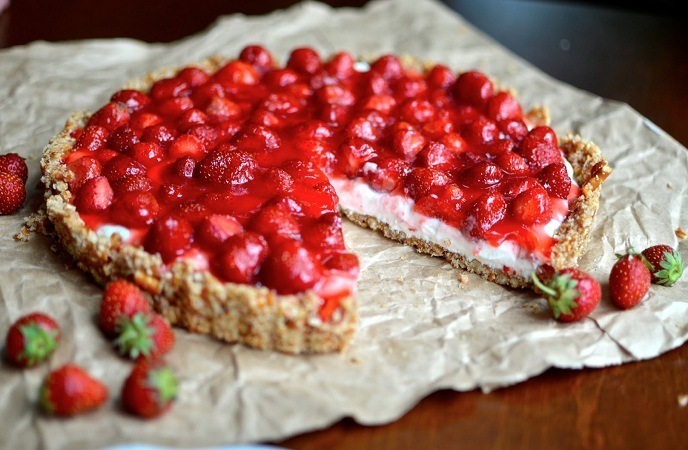 Sweet and light cream cheese layer on a pecan crust topped with strawberries. It is actually an amazingly tasty dessert for people at all ages! Mix pecans, flour, and butter together in a bowl, and press into a 13×9 inch baking dish. Bake within ten to fifteen minutes; never make it brown. Set aside till the dish is totally cool. Mix the confectioners’ sugar and cream cheese in a bowl till all ingredients create a smooth paste. Add whipped topping and blend well. Spread the cooled crust over. Put it into the fridge within eight hours, or you can even leave it overnight. 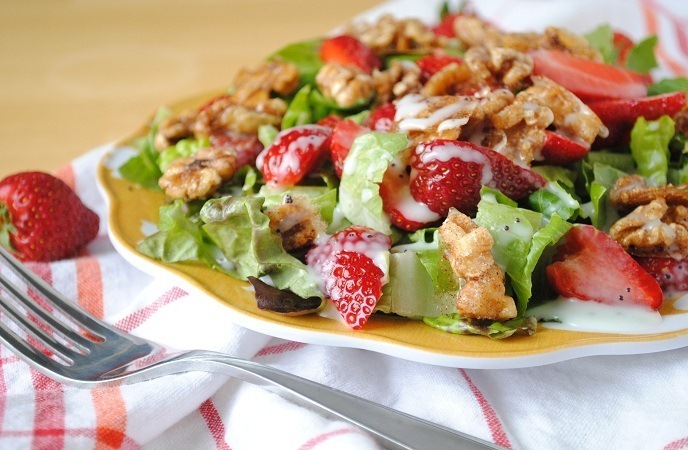 Drizzle the dish with glaze and use strawberries to top the dish before serving. 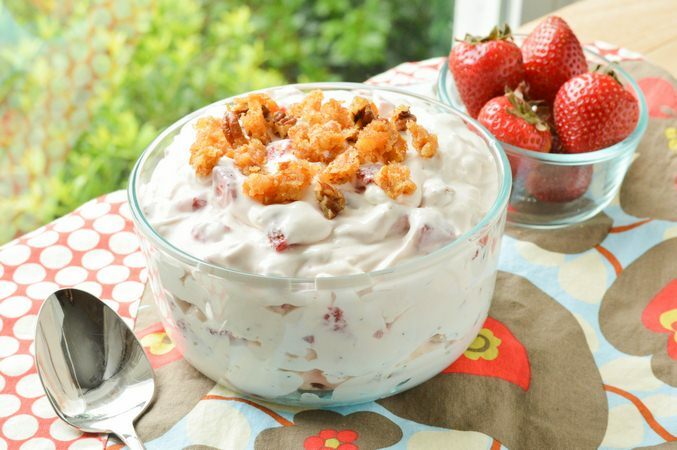 This is a strange yet very delicious blend of pecans, coconut, strawberries, meringue, and saltine crackers. Beat egg whites in a large-size bowl till they get the form of soft peaks. Gradually add cream of tartar and 1 cup sugar. Keep beating till the whites reach stiff peaks. Gently fold in pecans, coconut, and cracker crumbs. Spread the mix up the sides and onto the bottom of a nine-inch pie pan. In the preheated oven, bake till lightly browned or within about twenty minutes. Allow the dish to completely cool. Beat remaining sugar, gelatin, and cream in a large bowl till it reaches stiff peaks form. Fold in strawberries, and then pour to cover the egg white layer. Cover and put it into the fridge within about two hours. This is actually a very simple to make series of dessert squares. They could be made well with any fruit topping but cream and strawberries cannot be beat! Preheat oven to 175 degrees C (350 degrees F). Use cooking spray to spray a jelly roll pan’s inside bottom. Mix egg, butter, and sugar cookie mixture together in a large bowl till you have soft dough; evenly press it into the pan you prepared before. In the preheated oven, bake within ten to fifteen minutes or till crust turns light golden brown in color. Allow it to completely cool, within about half an hour. Use an electric mixer at its medium speed to beat cream cheese in a bowl till the cream is smooth. Add whipped topping and stir till the combination smooth; spread over crust. Put into the fridge. Mix cornstarch and sugar together in a two-quart saucepan; add vanilla extract, water, and one cup strawberries. Cook and stir strawberry mix over medium heat, using a spoon to mash strawberries while cooking till the strawberries are softened and the combination is thickened, within ten to fifteen minutes. Stir food coloring into the strawberry mix and take out of the heat; cool within ten minutes. Gently stir 3 remained cups strawberries into the strawberry mix; spoon over the cream cheese filling. Put into the fridge within about 60 minutes or until set. Serve after four hours. 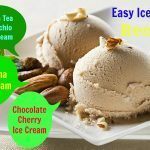 If you are looking for a special ice cream dessert, then this is actually perfect dessert idea for you! It is perfect for get-togethers on warm summer days. And it is very simple and quick to make as well. Over medium-low heat, melt butter in a large saucepan; take out of the heat. Add pecans, coconut, brown sugar, and rice cereal; stir well. Pat half the cereal mix into a 9×13-inch baking pan’s bottom. Slice the ice cream and spread the slices on top of the cereal mix; layer the remaining cereal mix on top of the ice cream layer. Put into the freezer within at least one hour – until set. Cut into squares before serving. This recipe makes tasty make-ahead dessert using strawberries, whipped dessert topping, cream cheese, and Twinkies. Mix glaze and strawberries in a small-size bowl. Slice the Twinkies in half lengthwise, and put in a single layer over a 9 x 13 inch dish’s bottom. In a mixing bowl, beat condensed milk and cream cheese till smooth. Fold in whipped topping, and spread the mix over the Twinkies. 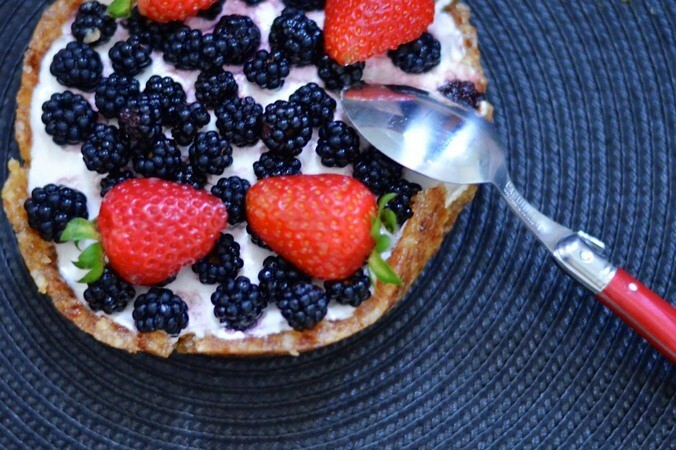 Spoon berries over the cream cheese mix. Cover and chill within at least half an hour. Put the leftovers into the fridge to store. This is actually an easy to make and sweet dessert salad that combines fruits, gelatin, and whipped topping. In a large bowl, mix the marshmallows, grapes, oranges, fruit cocktail, gelatin, and thawed whipped topping. Mix together well and put into the fridge to chill. Stir once again before you serve it. This is actually a special, beautiful cookie recipe which can really dress up a cookie tray. Over medium heat, combine the dates, eggs, sugar, and butter in a large skillet. Cook within about five minutes, or till the sugar is dissolved completely and the butter is melted. Stir in the salt and flour gradually, and keep cooking within about five to seven minutes. Take out of the heat and stir in the crispy rice cereal, almonds, and vanilla till every ingredient is well blended together. 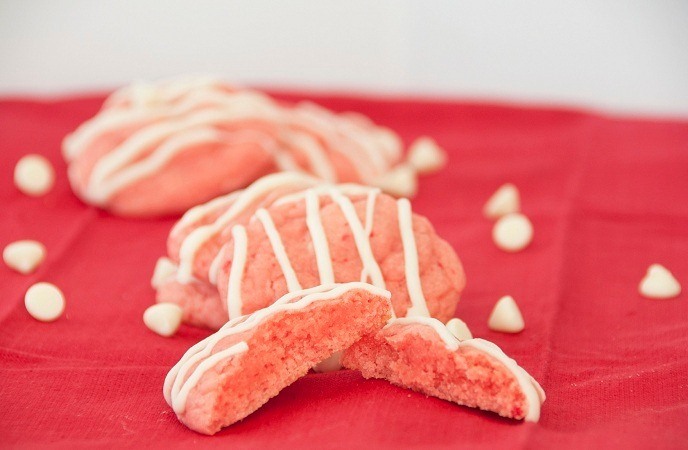 Roll the dough pieces into strawberry shapes. Roll the berries in red sugar and put a green leaf on top with a leaf tip attachment with pastry bag or frosting tube. This is a fruity, crunchy, and festive dessert. The pretzels in this recipe offer a crust for the filling of pineapple and gelatin. Preheat oven to 200 degrees C (400 degrees F). Combine 1/4 cup sugar, melted margarine, and crushed pretzels together in a medium bowl. Press the mix into a 13×9 inch baking pan. Beat 1 cup sugar, frozen whipped topping, and cream cheese in a large-size mixing bowl. Pour over pretzel crust. Mix strawberry-flavored gelatin and boiling water together in a large-size saucepan; bring to a boil. Add some frozen strawberries and stir well. When it starts to thicken, pour over cream cheese filling. Enjoy! Refreshing creamy whipped topping and sliced fruits over a tender cookie crust – a tasty, simple to make, yet impressive. Enjoy! Peaches and kiwi can be also added to pizza if you want. Evenly press the cookie dough into a 12-inch pizza pan. In the preheated oven, bake within about fifteen to twenty minutes, till golden brown. Cool on wire rack in pan. Spread over the cooled crust with whipped topping. Arrange fruits in a decorative pattern. Put into the fridge till you serve it. I love this pretzel dessert. You can make this dish to serve in Christmas and Thanksgiving. It will work effective with blueberry pie filling as well. Mix together in a bowl sugar, melted butter, and pretzels; press into a 13×9-inch baking dish’s bottom. In the preheated oven, bake the crust till it is lightly browned, within about ten minutes. Let it completely cool on its own. Stir cream cheese and confectioners’ sugar together in a bowl. Fold the cream cheese mix with whipped topping till smooth; spread over the cooled pretzel crust. 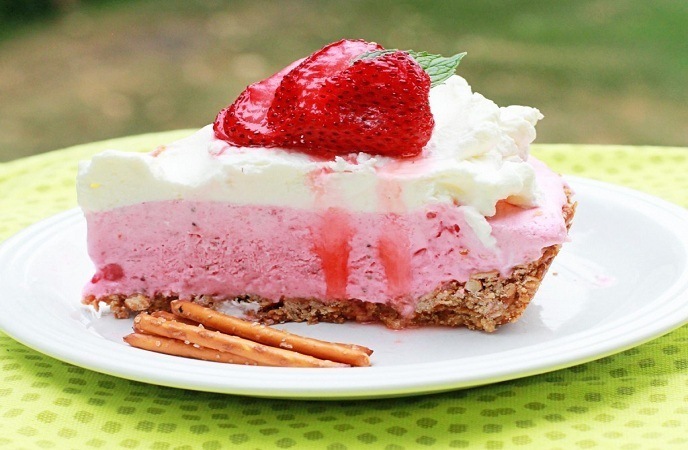 Over the cream cheese layer, spread strawberry pie filling. This is a creamy, cool summertime dessert. It uses rennet custard mix – which cannot be founded in any part of the world. In a medium bowl, mix confectioners’ sugar and flour together. Melt the butter and add to the mixture. Press the mix evenly into a 12-inch pizza pan. In the preheated oven, bake within fifteen minutes. Let it completely cool. In a small-size mixing bowl, beat white sugar and cream cheese together till smooth. Spread over cool crust. 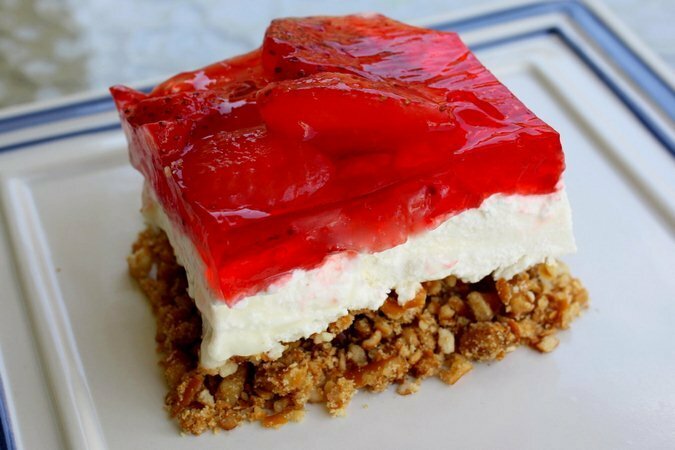 Put strawberries on the cream cheese layer. Mix the custard mixture and water in a small-size saucepan. Bring to a boil while f stirring. Boil and stir within 60 seconds. Pour mixture over strawberry layer. Chill before enjoying the dish! You should make this dish every year when the peach season comes so that you will have a wonderful dessert to serve. Make sure to use ripe, sweet peaches. You could also substitute other fruits; for example, raspberries, but fresh strawberry are always the best, trust me! Mix the 1/2 cup sugar, melted butter, and graham cracker crumbs in a mixing bowl. Mix till the mixture is evenly moistened, reserve 1/4 cup of the mix to make a topping. Press the remaining mix into a 13×9-inch baking dish’s bottom. Over low heat, heat milk and marshmallows in a large-size saucepan and stir till the marshmallows are fully melted. Turn off the heat and allow the mixture to cool on its own. Whip cream in a large-size bowl till it reaches the soft peak form. Beat in 1/3 cup sugar till the cream has the stiff peak form. Fold into the cooled marshmallow mix with the whipped cream. 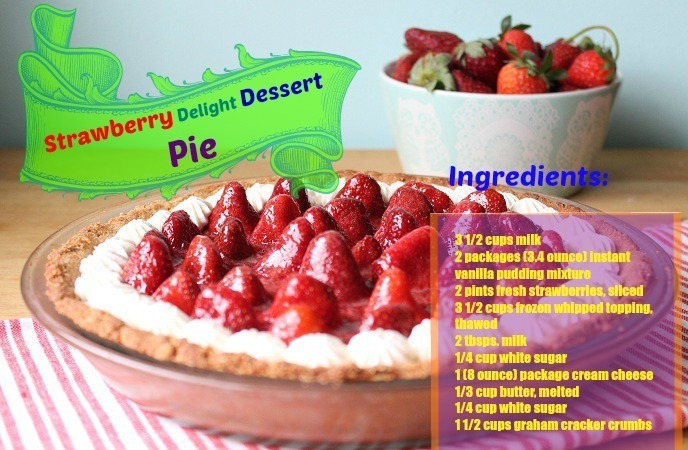 Spread half of the cream mix over the crust; put strawberry on top of the cream, and then spread the rest of the cream mix over the strawberries. Sprinkle the reserved crumb mix over the cream. Put into the fridge before you serve it! 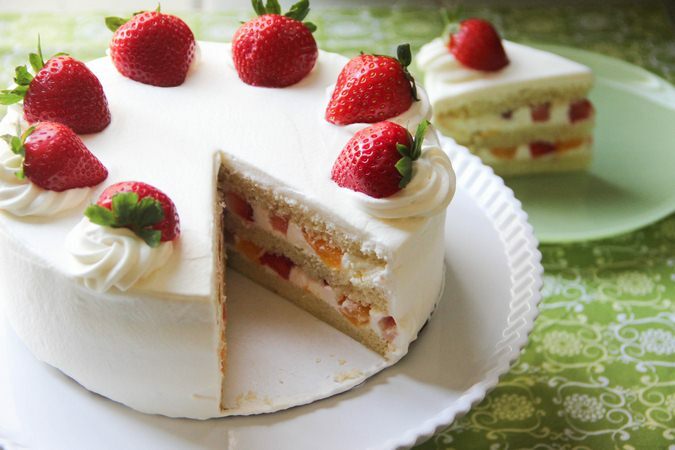 This is just simply strawberry shortcake yet coming with an extra surprising filling inside. Instead of chocolate syrup, you can use melted chocolate chips if you like. Put the shortcake on a plate and use peanut butter to spread into the cup of the cake. 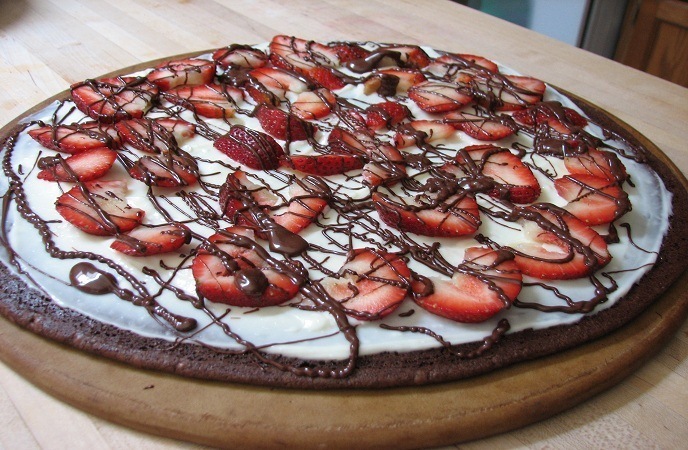 Top with strawberries and whipped cream; drizzle over the top with chocolate syrup. This dish would be perfect for people when showering or to be served in any get-together where people are serving finger-foods. In addition, this would be a wonderful dessert on a family taco night. Beat ground cinnamon, vanilla extract, brown sugar, and cream cheese together in a bowl till you have a smooth mixture. Use a round cookie cutter to cut three-inch circles out of every tortilla. Fold the tortilla rounds into the taco-shell shape. Hold folded tortilla with tongs and cook in the oil you preheated before within about two or three minutes or till the tortilla is golden brown and the taco shape holds. Take out the cooked tortilla and transfer to a paper-towel lined plate. Keep doing this with the rest of the tortilla rounds. Sprinkle over cooked tortilla rounds with cinnamon sugar. 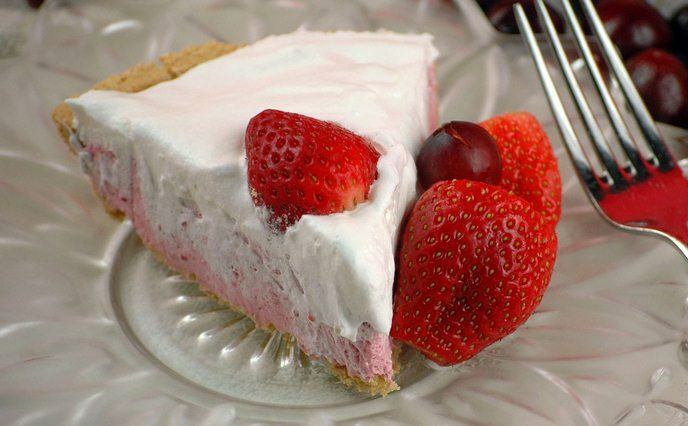 Spread the cream cheese mix into every shell; top with strawberries and grapes. 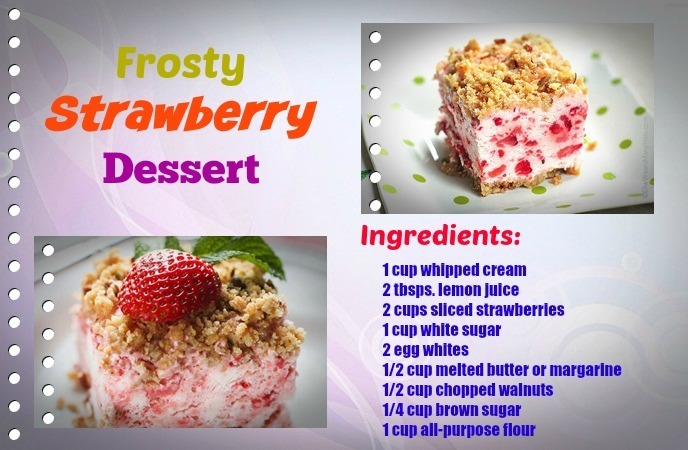 This is a very light dessert recipe that you can make at home to give your family members. 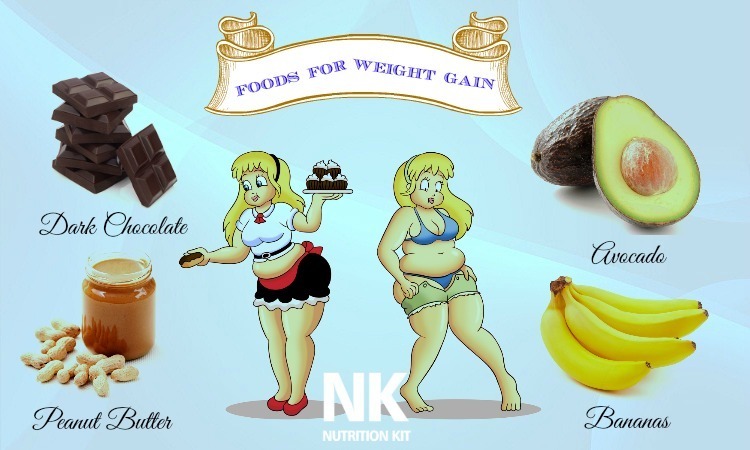 It is very simple to prepare and would be an ideal ending to your heavy meal. According to package directions, prepare the pudding with milk. In a glass serving dish or a trifle bowl, layer ½ strawberries, ½ bananas, ½ pudding, ½ cake pieces, and ½ the whipped topping. Repeat every layer. Cover and put into the fridge within four hours before enjoying the dish! This is actually the simplest dessert in the world! Strawberries should be dipped in chocolate and you will be about to taste an explosive dessert! In a double boiler’s top over simmering water or in a microwave-safe bowl, melt the chocolate. Stir occasionally till the chocolate becomes smooth. Holding the berries by the stem; dip each strawberry in molten chocolate, about ¾ of the way to the stem. Put on the rack with the stem side down and put into the fridge till hardened. 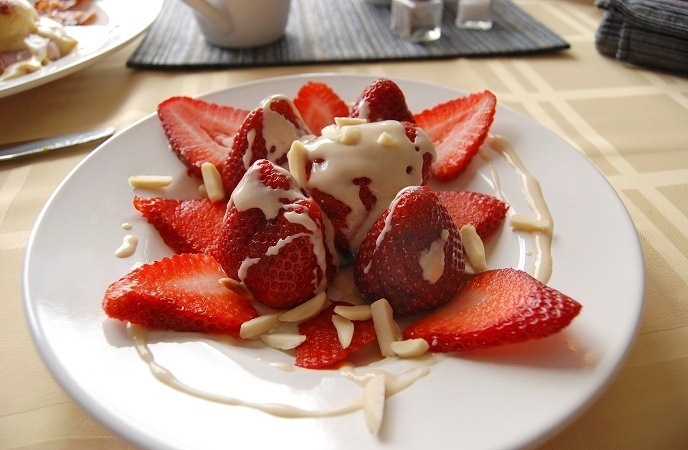 This is actually an elegant and quick strawberry dessert made with an irresistible cream sauce and fresh strawberries. It will look as delicious as it tastes! Stir whipped cream, vanilla ice cream, and sour cream together in a medium-size bowl. Gradually add orange liqueur to the mixture and stir well. Divide the berries between 2 parfait glasses, and spoon the cream mix over them. Garnish with shaved chocolate and mint leaves. 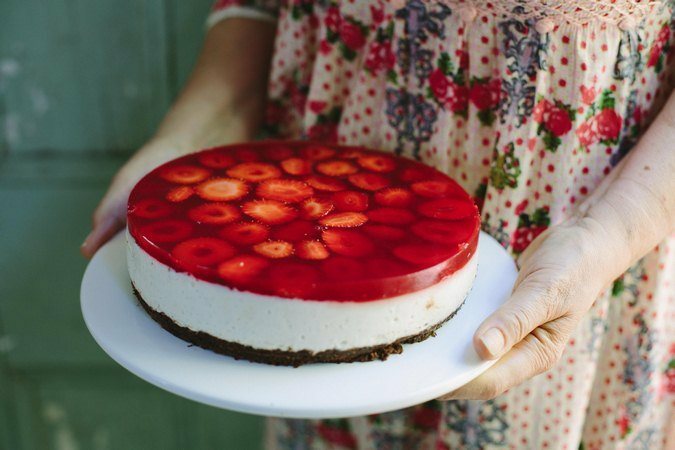 This is a delightful strawberry dessert that would be eaten quickly. Cream together white sugar and cream cheese in a bowl till smooth. Stir in 1/2 tsp. vanilla extract, almond extract, and sour cream. Fold confectioners’ sugar and remaining 1 tsp. vanilla extract into thawed whipped topping in another bowl till all ingredients are mixed well. Gently fold the whipped topping mix into the cream cheese mix till all ingredients are well-combined. Use 1/4 angel food cake pieces to layer the bottom of a glass serving bowl. Top with a layer of strawberries and 1/4 cream mixture; keep layering 3 more times till all the cream mix and cake is used. Last, put a layer of strawberries. Put into the fridge till ready to serve. This is actually a beautiful dessert, a favorite recipe of farmers, and it would be ideal to be served in every occasion. Use an electric mixer to beat salt, cream of tartar, and egg whites in a large-size bowl till the soft peaks form. Beat in 1 tbsp. sugar at a time, till glossy, stiff peaks form. Beat in vanilla, vinegar, and cornstarch just till all ingredients are well-blended. 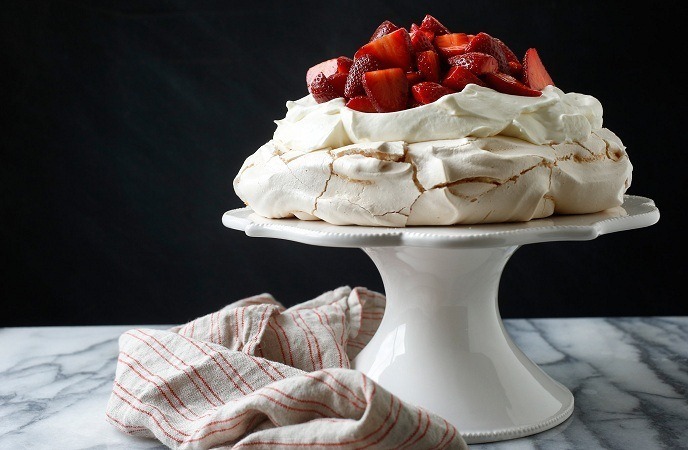 On a baking sheet lined with a foil or a parchment paper, spread meringue into a 25 cm (10-inch) circle with a slight indentation and a raised edge in the center. Bake in a preheated 120 degrees C (250 degrees F) oven till firm to the touch, about 1.25 hours. Meringue should be cream-colored. If it turns browning, lower the oven temperature to 105 degrees C (225 degrees F). Turn off the oven, take out the dish, and allow it to cool down on its own. When you want to enjoy this dish, peel parchment paper off back of meringue. Put the meringue onto a serving plate. Cut the large-size strawberries into slices or halves. Whip cream till you see stiff peaks. If you want, try gently stirring in liqueur. Spread whipped cream over the visible meringue leaving edge. Add strawberries onto the top. Cut into wedges before serving. 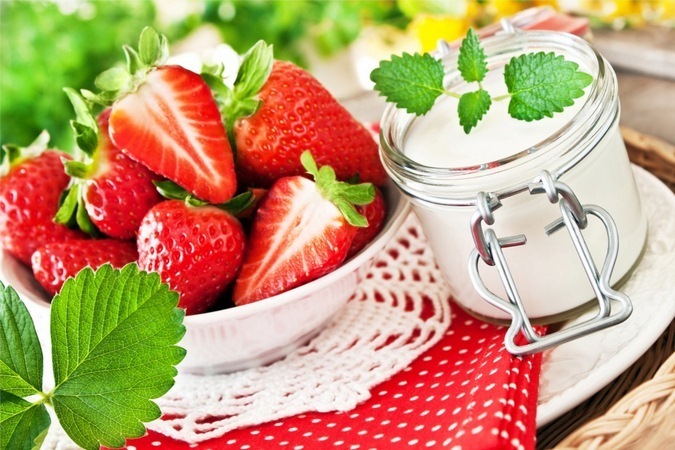 This would be the best-tasting cream and strawberries combination you have ever tasted! Mix the sugar and strawberries together in a bowl; mash till the sugar is incorporated and the strawberries are totally crushed. Add to the strawberries with the sour cream covered and stir till the mix turns to pink in color. Serve right away. This is a very nice salad that you can make whenever you make brunch to serve together. Hope you and your family like it! Mix water and gelatin together. Stir till dissolved, and then add frozen strawberries. Put into the fridge until it is slightly firm. Fold in pineapple and nuts. Stir in whipped topping. Refrigerate till serving. This is really a perfect addition for cookie trays for parties! Combine coconut, pecans, and gelatin. Stir in vanilla and milk; mix well. Chill 60 minutes. Shape into strawberries. Roll in red sugar; tint sliced almonds using green food coloring and insert in the berries’ top to make leaves. This culinary is a version of traditional angel food cake, and it is actually a refreshing dessert for summer and spring days. Toss 1/2 cup confectioners’ sugar and strawberries within a bowl; set aside at room temperature within about 60 minutes to get the fresh juice. Whisk sea salt, baking powder, white sugar, and flour in a bowl. Cut unsalted butter into the flour mix with a pastry cutter till the mix resembles coarse crumbs. Pour one cup of cream into the flour mix, starting with half a cup and adding 1 – 2 tbsps. at a time according to your own desire. Stir well till soft dough is created. Stir in more cream if you need. Put the dough into a floured bowl and use the heel of your hand to knead 2 – 3 times. Roll the dough out half inch thick on a floured surface; use a biscuit cutter to cut the dough into six 3-inch rounds. Put onto the baking sheet (ungreased). Bake till the tops turn golden brown, within about ten to twelve minutes. Put onto the wire racks to cool. Use an electric mixer to whip the remaining one cup cream in a glass bowl or metal till the cream get soft peak form as the beaters are directly lifted up out of cream; fold in vanilla extract and two tbsps. of confectioners’ sugar gently. Cover and put the cream into the fridge till you want to serve it and it is ready. Before serving, use a serrated knife to horizontally split each shortcake round, and put the shortcakes’ bottoms onto serving plates. 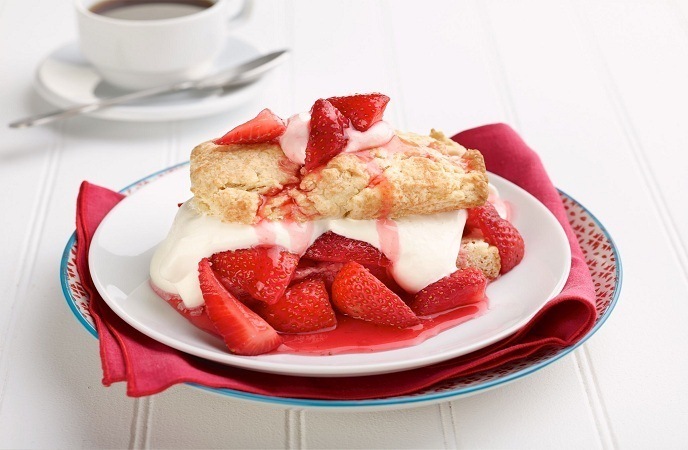 Spoon about half a cup of strawberries and juice onto half a shortcake; use ¼ whipped creams to top. Put the shortcake tops onto the dessert; dust every cake with a sprig of mint and about one tsp. confectioners’ sugar. This recipe is really a surprise for your whole family. It is really delicious and light dessert after a summer BBQ get-together. Preheat oven to 150 degrees C (300 degrees F). Mix butter, sugar, and flour till crumbly. Add chopped walnuts and stir well. Press 2/3 of the mix in a 13×9-inch baking dish’s bottom; the rest of the crumble would be used to top the dessert. In the preheated oven, bake the dessert within about twenty minutes. Allow the crust to completely cool down. In large-size deep bowl, stir together lemon juice, strawberries, sugar, and egg whites. Use an electric mixer to whip at high speed within ten minutes. Whip whipping cream till stiff and fold into the strawberry mix in another mixing bowl. Spread over cooled crust. Sprinkle with the rest of the crumb mix. Freeze within six hours or overnight before you serve it. Do you ever purchase too much of fresh raspberries, blueberries, and strawberries in the summer just ‘cause they look so sweet and rich? 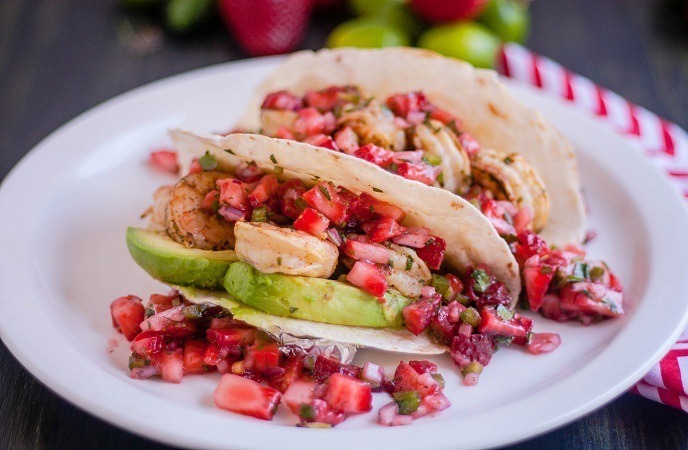 Then you can try this recipe as it is a way to utilize the remaining berries! It is ideal for appetizer-type parties, large picnics, or gatherings! This recipe is very easy to prepare at home. Everyone would love this right at the first time you give them. You can also substitute an appropriate fruit, banana slices, or blackberries of your own favorite. Be careful with the blueberries though as they can stain your skin. In a bowl, combine the sweetened condensed milk and frozen whipped topping. Fold in 1.75 cup raspberries, 1.75 cup strawberries, and 1.75 cup blueberries gently. Top with remaining raspberries, strawberries, and blueberries. Use mint to garnish, and chill till you serve it. 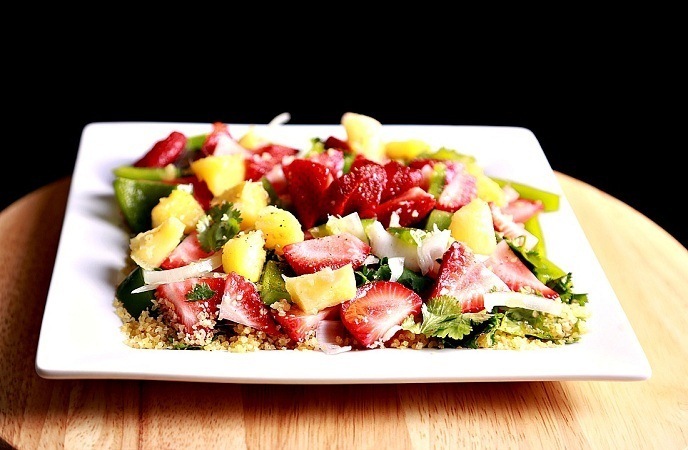 This is a refreshing salad served for summer days or holidays. 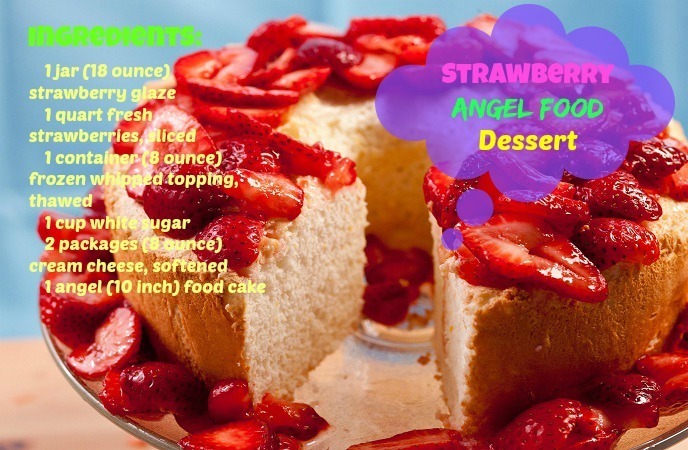 This is a great mixture of angel food cake, strawberries, and flavored gelatin. 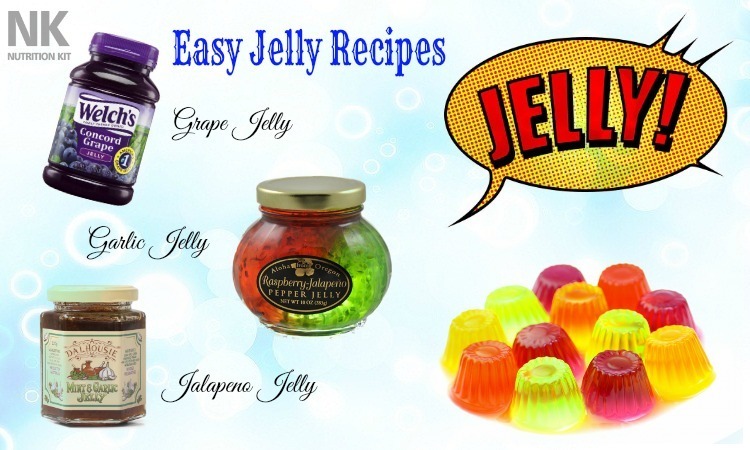 Mix together boiling water with flavored gelatin in a large-size mixing bowl and stir till dissolved. Stir in frozen strawberries and cold water. Chill till slightly thickened to the egg white’s consistency. If you add a lot of frozen strawberries, it might reach this stage while stirring. Cut the cake to get small-size cubes, or just rip it into bite-size chunks, as well as trimming the dark brown edges off. 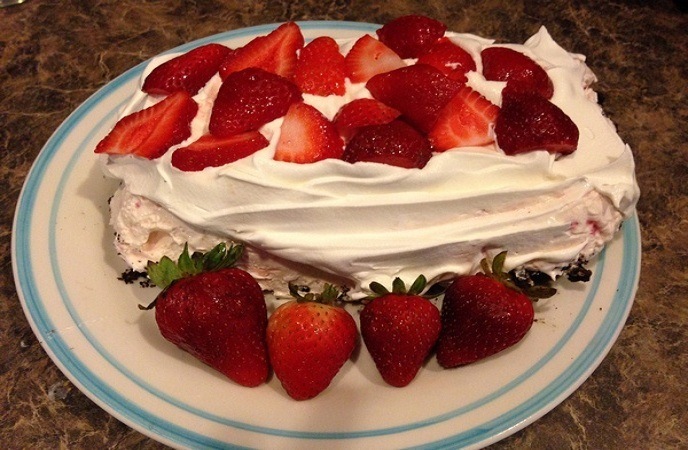 Fold in cake and frozen whipped topping gently into the strawberry mix. Chill till set. 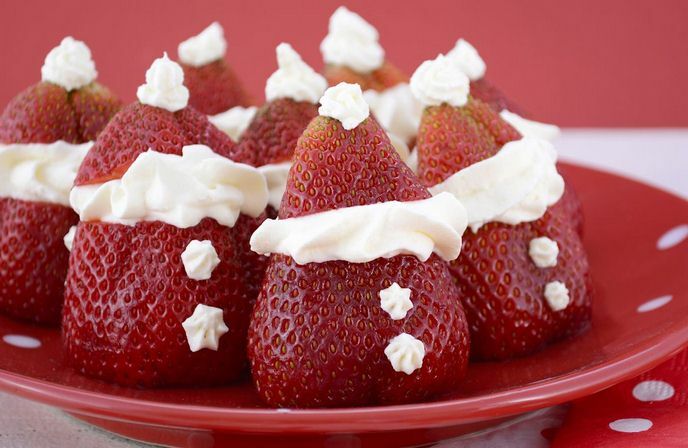 Use strawberries and any extra topping to decorate on top. 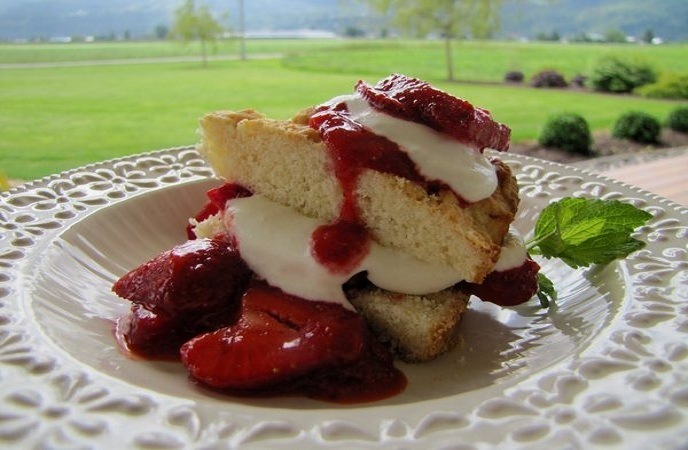 This strawberry topping is ideal for strawberry shortcake. You can increase or decrease the amount of sugar according to your own taste buds and the sweetness of your berries. Over medium heat, combine dark corn syrup with strawberries in a saucepan. Bring to a boil, and turn down the heat to low level. Stir till the strawberries give up their juice and the combination simmers within ten minutes. Turn off the heat and stir in lemon juice and sugar till sugar has dissolved. Allow it to cool at the room temperature and put into the fridge before you serve. In a mixing bowl, mix the pineapple, whipped topping, cottage cheese, and gelatin mix. Combine well together, put into the fridge till chilled and serve. This is a fluffy and light, as well as elegant and easy dish to make that everyone can make at home! Strain strawberries and set aside and reverse juices. Bring strawberry juice and cornstarch to a gentle boil in a saucepan. Turn off the heat and allow it to cool. Whip vanilla, sugar, and cream cheese together. Beat whipping cream till it reaches the stiff peak form in a separate bowl. Fold whipped cream into cream cheese mix. Put the ladyfingers around bottom and sides of the eight or nine inch spring-form pan, standing every ladyfinger lengthwise around the pan’s sides. Pour half of the filling into the pan, and then put a ladyfinger layer on top of the filling. Pour the rest of the filling over ladyfingers. 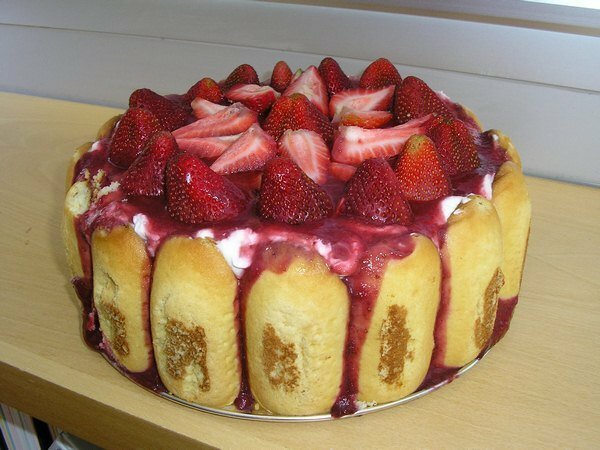 Spread over top of cake with the strawberry sauce and put the whole strawberries as a topping. Put into the fridge and get out of the pan once chilled thoroughly. 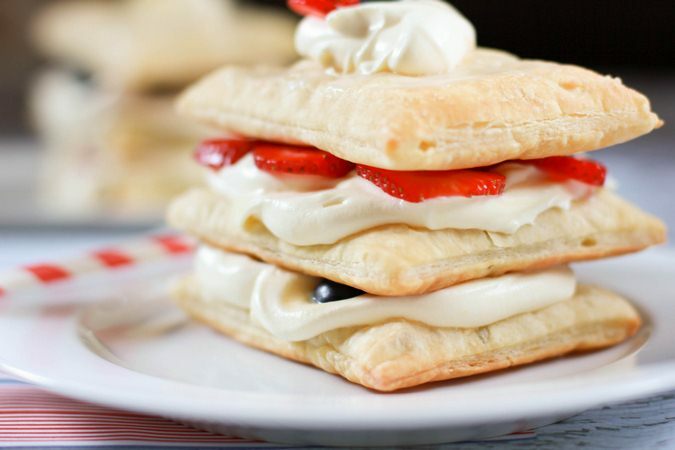 This tasty, attractive, and super-easy to make ((most importantly) puff pastry recipe could be easily made low-fat by using skim milk and fat-free whipped topping. You should make this dish and enjoy it at the same day to achieve the best results. Serve it right away and feel! Preheat oven to 200 degrees C (400 degrees F). Mix cold milk and pudding mix; fold in whipped topping. Put into the fridge till serving. Unfold pastry on a lightly floured, cool surface. Cut into three strips along fold marks, and then cut all strips into 4 equal pieces. Put on a baking sheet two inches apart. In the preheated oven, bake within about fifteen minutes, or till golden brown. Take out of the baking sheet, and allow it to cool down on its own. Split pastries into two layers, setting the eight best looking tops aside. Use dollops of the pudding mix to spread eight bottom layers. 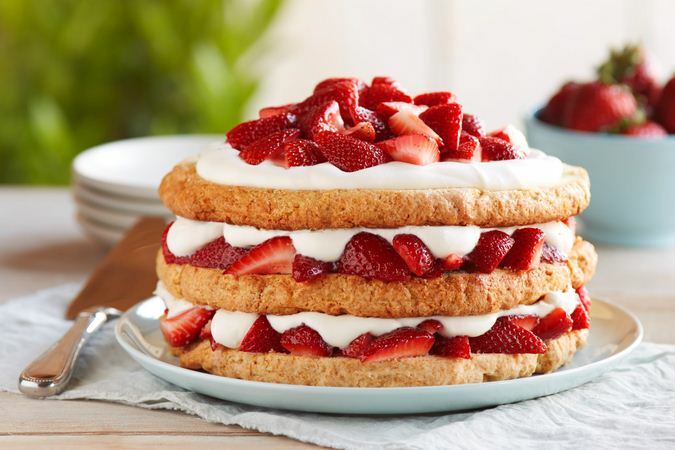 Use every one layer of strawberries to top each dessert, following with some pudding, and an additional pastry layer. (A small amount of the pudding mix on top of the berries would help in keeping all layers together.) Spread with strawberries and the rest of the pudding mix, and use the rest of the pastry layers to top (the most beautiful ones). Use confectioner’s sugar to sprinkle. 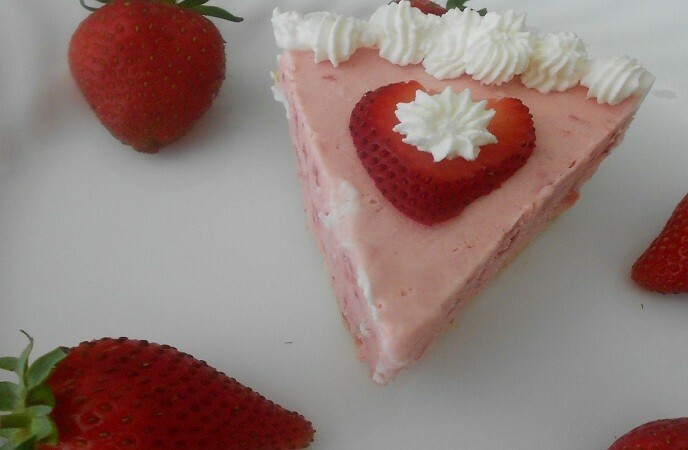 This creamy strawberry cheesecake is ideal for all special occasions! You will need to bake the cake and allow it to cool down naturally within 60 minutes, and then chill it in the fridge for four hours or more prior to serving. Combine butter, cinnamon, sugar, and graham cracker crumbs in a bowl. Press onto the ungreased 9-inch springform pan’s bottom. Put into the fridge within half an hour. Put cornstarch and strawberries into a blender. Cover and puree till you get a smooth combination. Pour into a saucepan with strawberry sauce. Over high heat, bring to a boil. Boil and stir till you get a thick and shiny sauce, within about two minutes. Set aside 1/3 cup of strawberry sauce; allow it to cool on its own. Cover and put the rest of the sauce into the fridge for serving. In a mixing bowl, use an electric mixer to beat cream cheese till it turns fluffy and light; beat in condensed milk gradually. Mix in vanilla extract and lemon juice, and then beat in eggs on low speed till all ingredients are just combined. 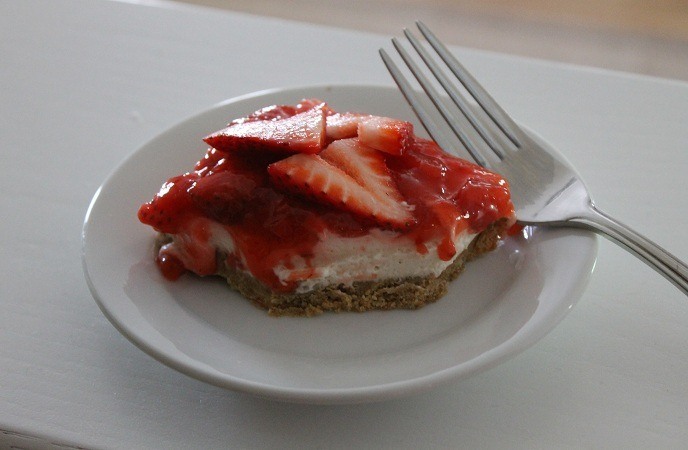 Pour ½ cream cheese mix over crust; drop ½ reserved strawberry sauce by half a tsp. on cream cheese layer. Spoon the rest of the cream cheese mix over sauce carefully; drop the rest of the strawberry sauce by half a tsp. on top. 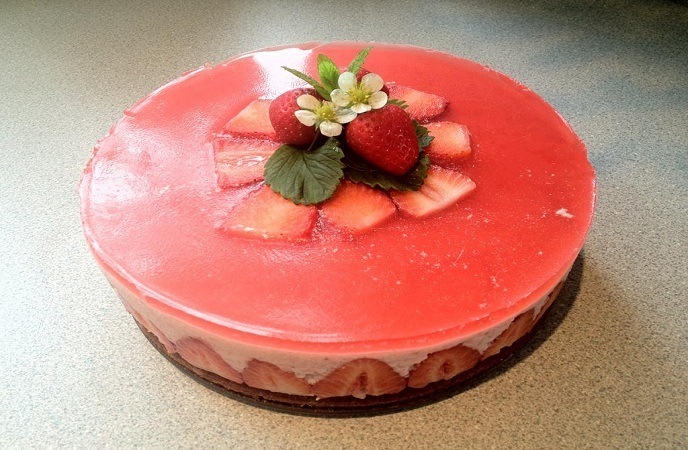 Just use a knife to cut through top layer to swirl the strawberry sauce. In the preheated oven, bake within 45 to 50 minutes till the center is almost set. Put on the wire rack to cool within ten minutes. Run a knife around the pan’s edge to loosen carefully; allow it to cool down within about 60 minutes longer. Put into the fridge and let it stay overnight. 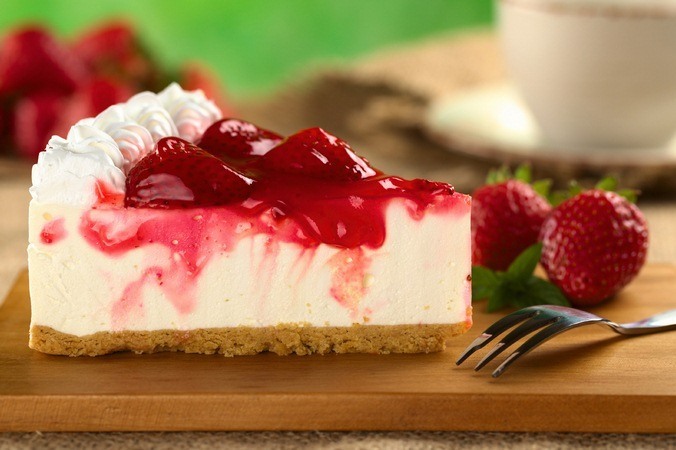 Serve the cheesecake with the reserved strawberry sauce. Add more water if the sauce it too thick. 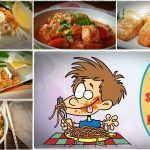 You should make this dish to give your family members and friends and they will definitely love it! This is actually crepes with a whipped topping, strawberries, and chocolate. Beat together oil, water, milk, and egg in a large-size bowl. Beat in salt, sugar, and flour till smooth. Over medium-high heat, heat a medium-size, nonstick skillet. Put a ladleful of crepe batter into a pan’s center, tilting to coat the pan’s bottom. Cook till golden brown on each side; just turn once, within two to five minutes. Continue with remaining batter. Over low heat, melt chocolate chips in a small-size saucepan, stirring constantly. Turn off the heat. To assemble, spread on the one crepe’s lighter side with some melted chocolate. 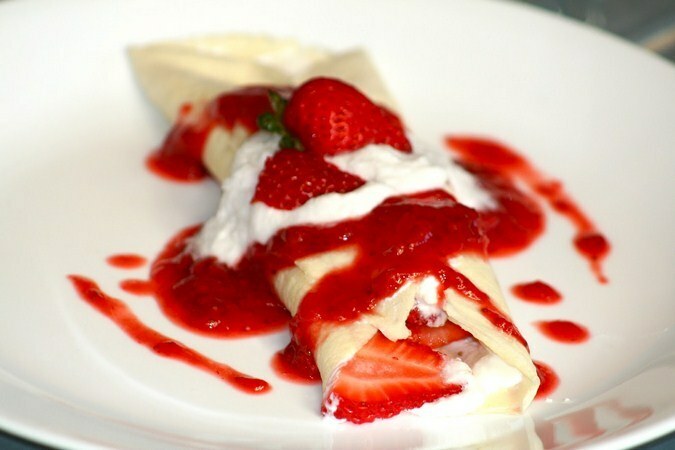 Put a line of overlapping strawberries down the crepe’s center and roll it up. Drizzle with some more chocolate and top with whipped topping. Do again with the rest of the crepes. These strawberries are made from colored sugar crystals, coconut, and strawberry flavored gelatin. Blend together the condensed milk and gelatin. Add vanilla and coconut; mix well and put into the fridge till chilled. Roll into small balls and make the strawberry shape; roll in red sugar crystals. Dip fat end into the green sugar crystals. For a stem, put an almond sliver into the fat end. For preventing hardening, store in an air tight container till serving. Warm balsamic strawberries will melt the ice cream, giving a strawberry Romanoff decadence without offering high calorie levels. You can also try serving these deserts with yogurt on top. Over medium heat, melt butter in a large-size skillet. Add the balsamic vinegar, sucrolose sweetener, and strawberry halves. Cook till the strawberries are heated through and darkened to the color of ruby red. Put the scoops of ice cream into stemmed glasses or dessert bowls. 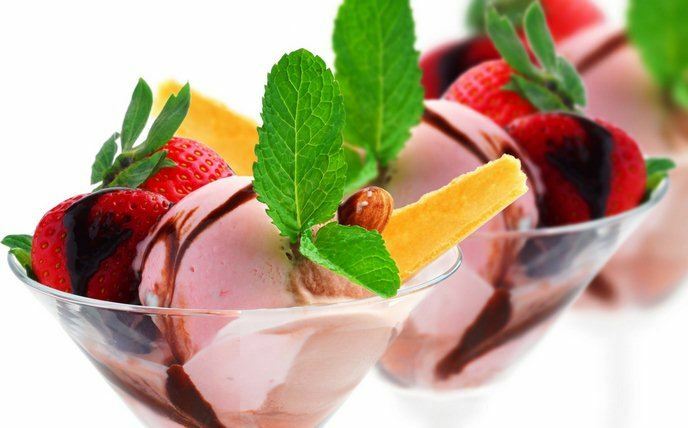 Spoon over the ice cream with strawberries and enjoy! This is a great dessert item! These strawberry sparkles are tasty and sweet! Try them anytime you crave for sweetness! They will also add fantastic colors to your table. Try making blue sugar color, white, and red for a great 4th of July look. It is also very wonderful for picnics. In a small bowl, beat vanilla, milk, confectioners’ sugar, and cream cheese till smooth together. Put into the fridge within 2 hours to chill. Stir together food coloring and white sugar. Dip strawberries in cream cheese mix, then in tinted sugar. Put into the fridge till you serve. This is a great dessert that is refreshing and light. 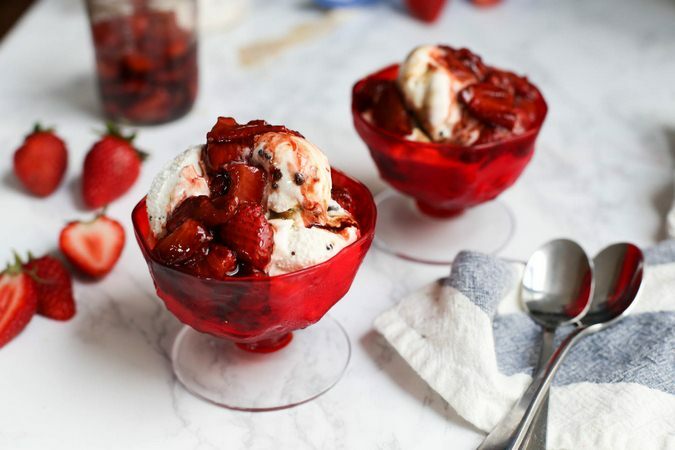 The strawberries should be marinated in the wine for hours for a brand new wine version with strawberry flavor at the bowl’s bottom that everyone would be fighting for. You can change the amounts of sugar according to the sweetness of your prepared berries. 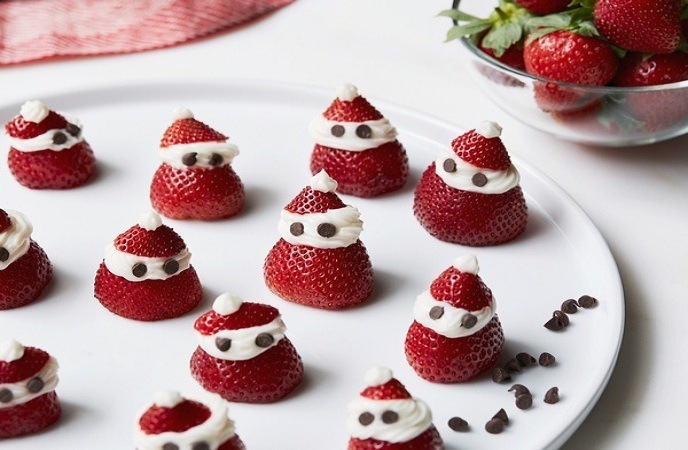 This is a perfect way to dress up not-too-sweet strawberries! Champagne could be substituted for the wine. Put strawberries into a medium-size bowl. Dust with sugar, and then pour the wine over them. Cover and put into the fridge within two or three hours. 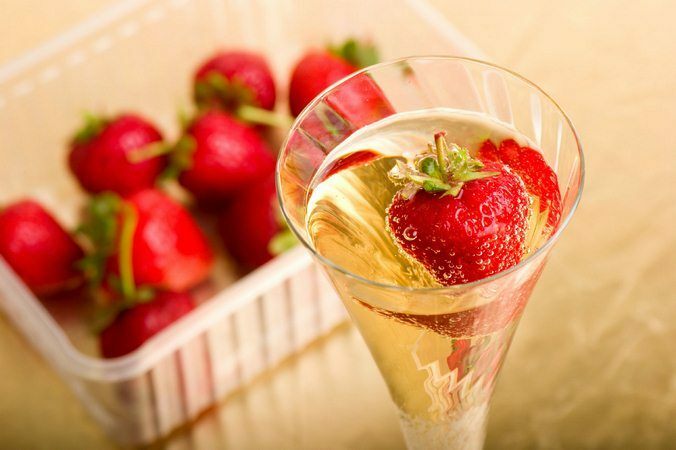 Allow the strawberries to stay at room temperature within fifteen to twenty minutes before serving. 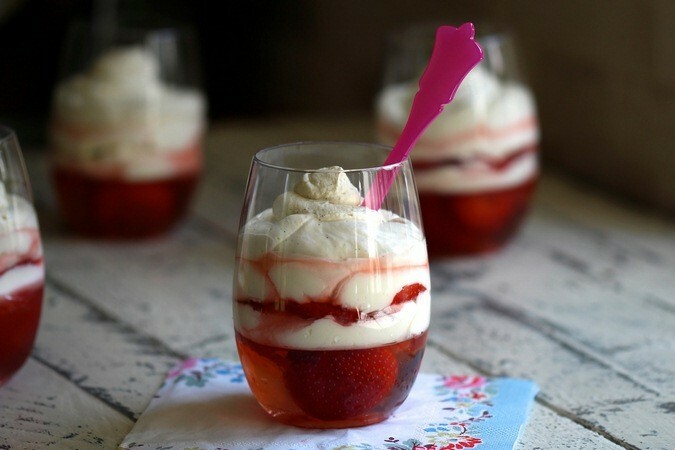 Spoon berries into six dessert cups, and distribute the rest of the wine you prepared over the strawberries. 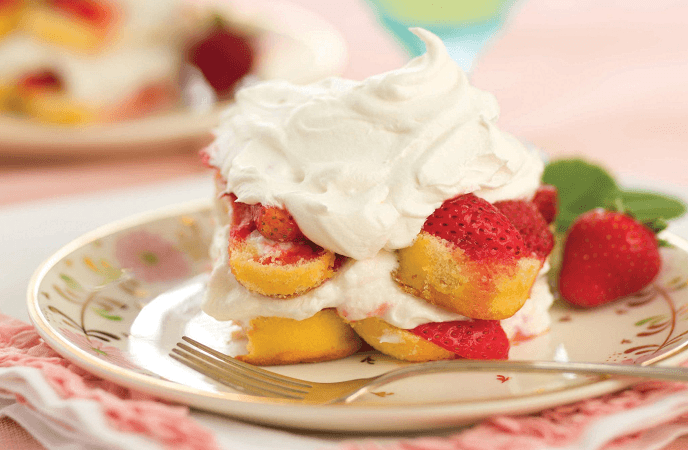 This is tender, old-fashioned shortcake that comes with 2 layers of strawberries topped with whipped cream. Prepared sliced strawberries and toss them with half a cup of white sugar. Set aside. Preheat oven to 220 degrees C (425 degrees F). Grease and flour an 8-inch round cake pan. In a medium-size bowl, mix together the salt, 2 tbsps. of white sugar, baking powder, and flour. 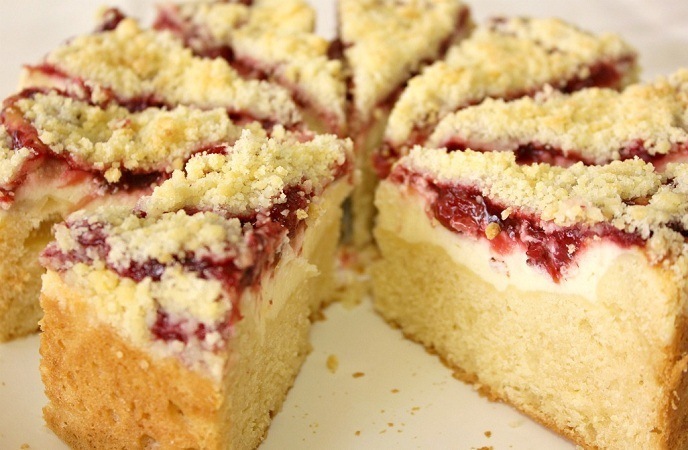 Cut in the shortening using a pastry blender till the combination resembles coarse crumbs. Create a well in the center and add the milk and beaten egg. Stir till just mixed. Spread the batter into the pan you prepared before. Bake at 220 degrees C (425 degrees F) within fifteen to twenty minutes or till golden brown. Allow it to cool down partially on wire rack in pan. Slice the partially cooled cake in half to get 2 layers. Place ½ the strawberries on 1 layer and top with the 2nd one. Top with the rest of the strawberries and use whipped cream to cover. 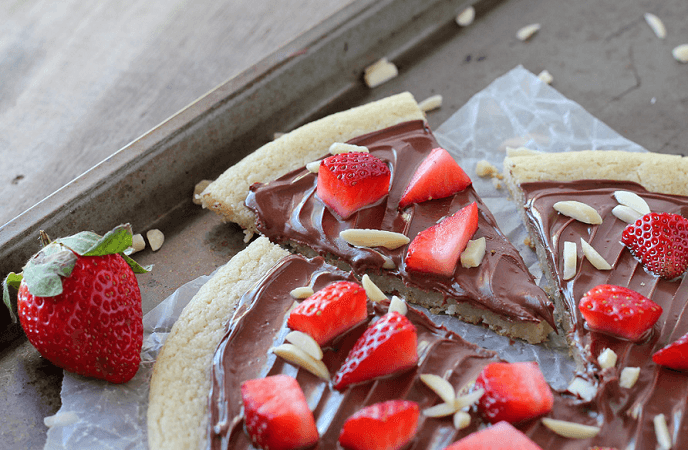 A light biscuit topped with tasty strawberries. Preheat the oven to 220 degrees C (425 degrees F). Whisk salt, 1/3 cup white sugar, baking soda, baking powder, and flour together in a mixing bowl. Stir in buttermilk till the flour mix is moistened. Drop 1/3 cup scoops of the dough two inches apart onto the baking sheet you prepared before. Brush heavy cream and biscuits and use turbinado sugar to sprinkle generously. In the preheated oven, bake till golden brown within fifteen to twenty minutes. Mix the sliced strawberries together with lemon juice and 1/4 cup white sugar in a large-size bowl. Let the berries to rest till juices develop within thirty minutes. Serve the strawberries over the biscuits with juice. Fresh strawberries would be added into a creamy whipped mix on a chocolate cookie base would be topped with more strawberries to create a wonderful frozen dessert. Line 5×9-inch loaf pan with foil, with ends of foil extending over sides of pan. Put two cups of the strawberries in a large-size bowl and mash them. Add juice, condensed milk, and two cups of the whipped topping; combine till all ingredients are mixed well. Pour into the pan you prepared before. Mix butter and chopped cookies. Spoon over the whipped topping mix. Cover with ends of foil and press the cookie mix gently into whipped topping mix. Freeze six hours or till it is firm. Invert the dessert onto serving plate as ready to serve; remove foil and pan. Spread the rest of the whipped topping onto sides and top of the dessert. Slice the rest of strawberries; put onto the dessert. Store leftovers in the fridge. 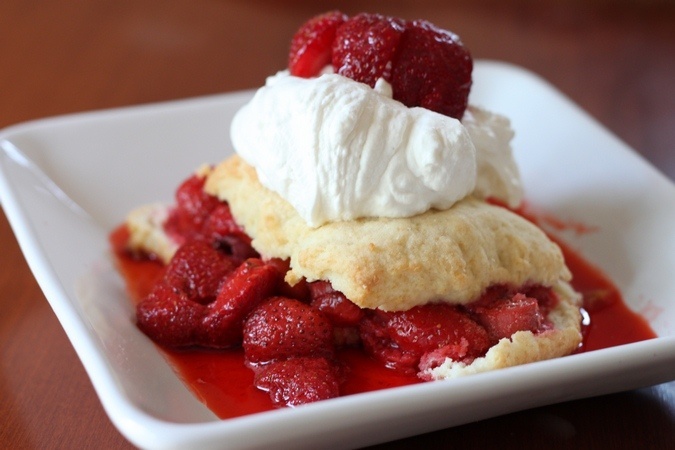 These shortcakes are the sweet sisters of biscuits, and they would be a great dessert when filled and topped with whipped cream and strawberries. Heat the oven to 425 degrees F. In large-size bowl, mix 1/4 cup sugar and strawberries together; set aside. In medium-size bowl, stir milk, Bisquick mix, 3 tbsps. sugar and butter till you get a soft dough. On a cookie sheet (ungreased), drop the dough by six spoonfuls. Bake within ten or twelve minutes or till golden brown. Meanwhile, in small-size bowl, use an electric mixer, beat whipping cream on high speed till you see the soft peaks. Split the warm shortcakes; top and fill with whipped cream and strawberries. 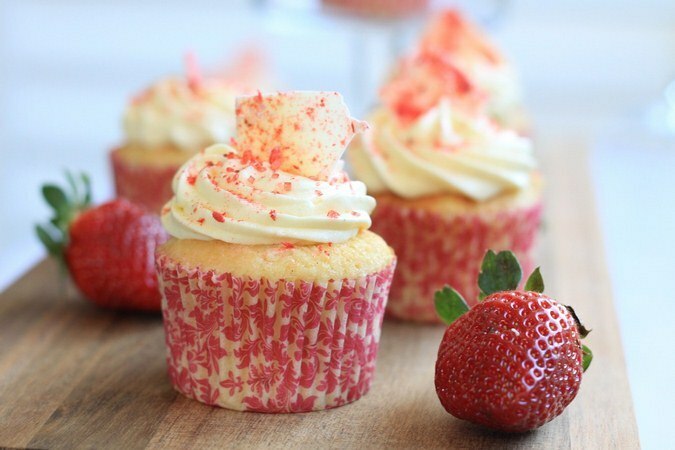 This is a wonderful strawberry cake recipe that you can make if you love cupcakes. Try using the cream cheese icing as a topper. For a 4th of July theme, you can use blueberries. Preheat oven to 165 degrees C (325 degrees F). Line with paper muffin liners or grease 24 muffin cups. 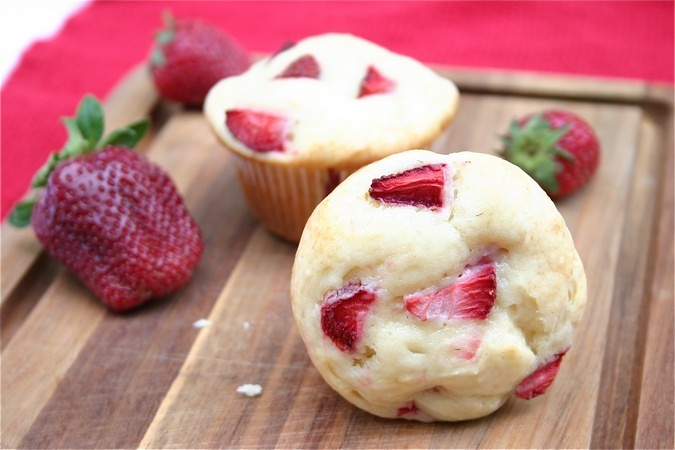 Use an electric mixer to beat vanilla extract, eggs, oil, pureed strawberries, and sugar in a bowl till smooth. Add flour and mix till just incorporated. Stir food coloring into strawberry batter till you get an even color. Divide batter into the muffin cups you prepared before. In the preheated oven, bake till you can use a toothpick to insert into the center and it should come out clean, within about fifteen or twenty minutes. Allow it to cool in the pans within about ten minutes before you remove to completely cool on a wire rack. 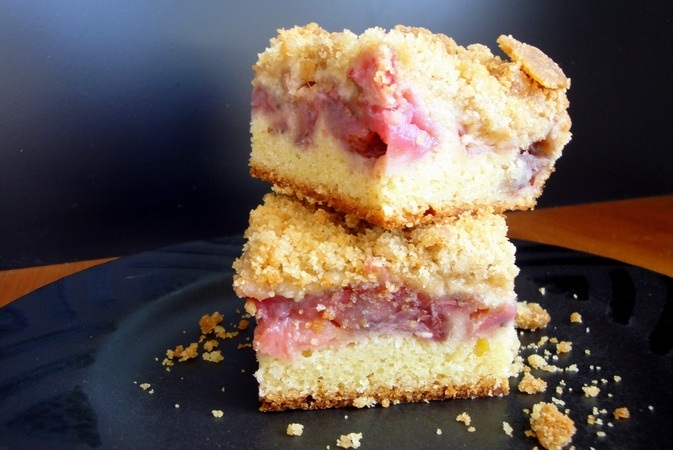 Strawberries and rhubarb are baked into a moist cake with a hint of orange to make this tasty dessert for spring. Preheat the oven to 175 degrees C (350 degrees F). Grease a 9-inch square baking dish. Put the strawberries and rhubarb into a mixing bowl. Stir in 2/3 cup of sugar till the fruits are coated. Pour into the pan you prepared before and spread out to cover the pan’s bottom. In a medium-size bowl, beat the rest of the sugar with the butter till fluffy and light, within about three minutes. Mix in the vanilla, orange zest, and egg. Combine the baking powder, flour, salt, and baking soda; stir into the batter to replace the buttermilk. Pour over the fruit in the dish with the batter. In the preheated oven, bake till you see a toothpick inserted into the center can come out clean, within about 55 minutes. This is a very quick easy dessert and you can prepare it within just a very short period of time. Mix whipped topping, sweetened condensed milk, and cream cheese together in a bowl till all ingredients are well-blended in a single smooth mixture. 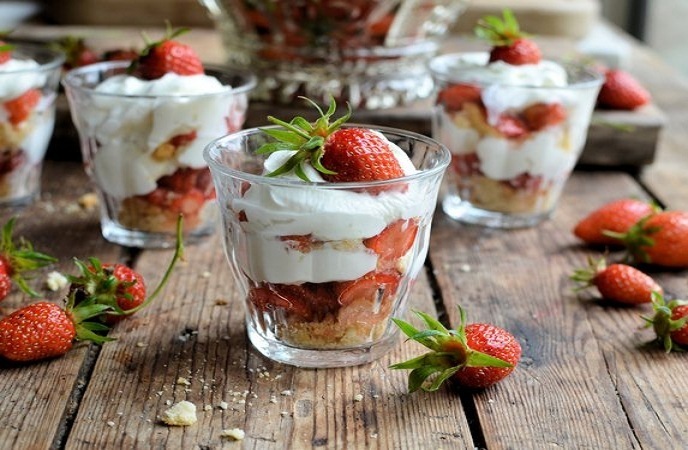 Use angel food cake cubes to sprinkle as a layer in a large-size glass bowl; top with a strawberry layer. 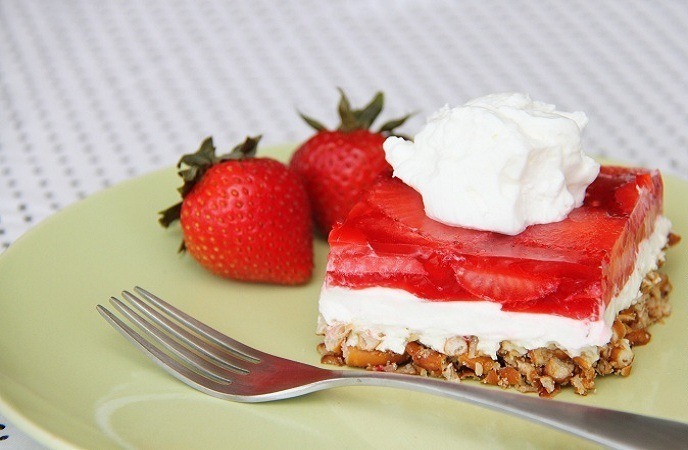 Spread a cream cheese mix layer atop strawberries. Repeat layers with the rest of the ingredients. Put into the fridge to chill within about half an hour to one hour before you serve. 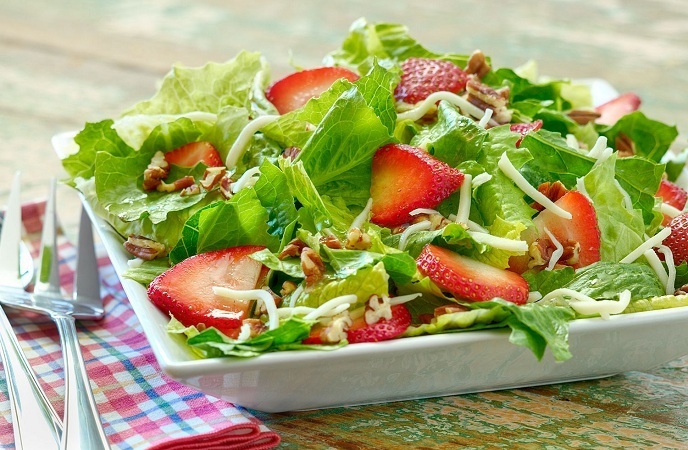 This 3-layer salad includes a strawberry top, a cream cheese center, and a pretzel crust. Preheat oven to 175 degrees C (350 degrees F). Mix together melted butter, 4.5 tbsps. sugar, and pretzels. Press into the bottom of a 13×9 inch pan. Bake within ten minutes, or till lightly toasted. Set aside to allow it to totally cool. In a medium-size bowl, beat the cream cheese and sugar till you get a smooth combination. Fold in whipped topping. Evenly spread over the cooled crust. Put into the fridge till set, within about half an hour. In a medium-size bowl, stir the boiling water and gelatin mixture together. Mix in frozen strawberries, and stir till thawed. Pour over cream cheese mix in pan. Put into the fridge till fully chilled, within 60 minutes at least. This is tangy and sweet dessert made with minimally processed ingredients. Combine cinnamon, 1/3 cup flour, honey, strawberries, and rhubarb in a large-size bowl; allow it to stay within five to ten minutes, stirring occasionally. Transfer the fruit mix to a 13×9-inch baking dish. Mix remaining 1 cup flour, nutmeg, molasses, and rolled oats in another bowl. Use a knife or a pastry blender to cut butter till the mix resembles coarse crumbs. Sprinkle crumb mix over fruit. In the preheated oven, bake till the crumb topping turns golden brown, within about thirty five to forty minutes. Lassi is a refreshing cool drink that can be also used as a light dessert for hot summer days. Cut 3 strawberries into small-size pieces and set aside. 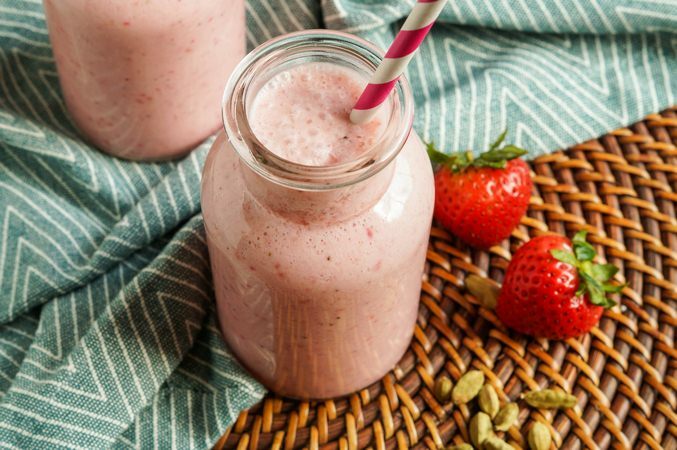 Put the sugar and the remaining strawberries in a blender; blend on high speed within about half an hour. Pour in the milk and blend within about half a minute more. Add yogurt and blend on high speed within 60 seconds. For serving, put one ice cube in every of three glasses and pour in the lassi. 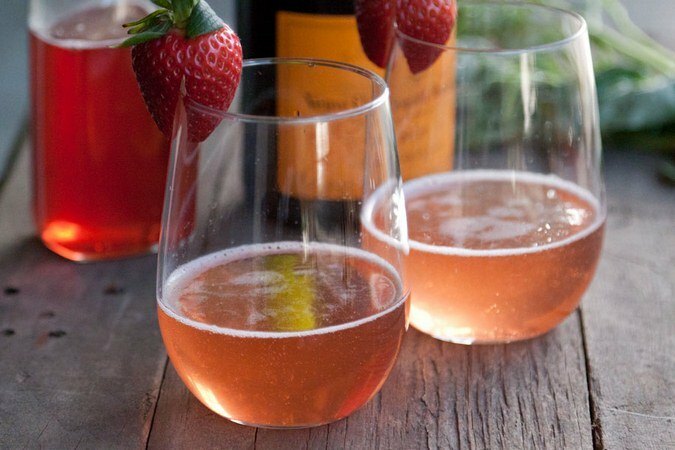 Use strawberry pieces to top and serve. It is a dessert, but is not too salty, nor too sweet. It is very beautiful if you put it in a clear ovenproof dish. 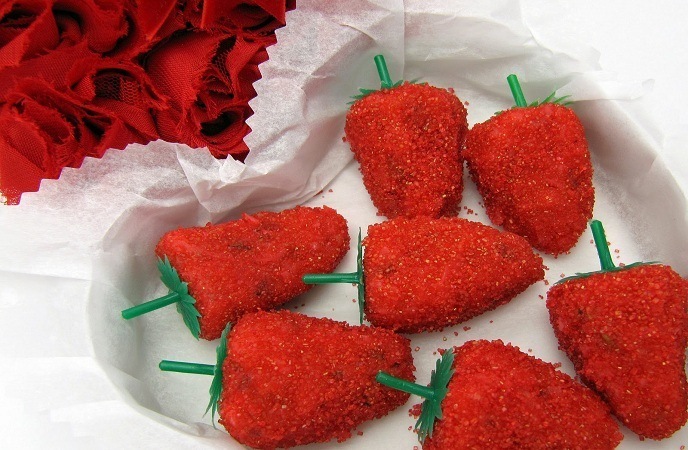 Roll into small-size balls and make the strawberry shape; roll in red sugar crystals. Dip into green sugar crystals with the fat end. For a stem, put an almond sliver into the fat end. To avoid hardening the dessert, store in an air tight container till serving. Stir together 3 tbsps. sugar, melted butter, and crushed pretzels; mix well and press the mix into a 13×9 inch baking dish’s bottom. Bake within eight to ten minutes, till set. Set aside and allow it to cool. In a large-size mixing bowl cream together 1 cup sugar and cream cheese. Fold in whipped topping. Spread the mix onto cooled crust. Dissolve gelatin in boiling water. Stir in frozen strawberries and let it set briefly. When the mix is about the egg white consistency, pour and spread over the layer of cream cheese. Put into the fridge till set. This dish is the combination of fresh strawberries with light syrup and fresh mint topped with ice cream and whipped cream after that. This is a tantalizing and tasty dessert for hot summer days! Mix the mint and strawberries in a bowl. Combine the sugar and water in a small-size saucepan and bring to a boil. Lower the heat to medium and simmer till the combination reaches a thin consistency of syrup, within three minutes. Drizzle syrup over the mint and strawberries and toss gently. Divide berries into 4 serving-size cups. Top each with a dollop of whipped cream and ice cream. Use a mint leaf to garnish. This is a yummy, nutritious morsel of a dessert. Use wild strawberries to achieve the full flavor. In a bowl, whisk together the strawberry milk powder, sugar, milk, and yogurt. Put the strawberries as a top layer, and serve right away. 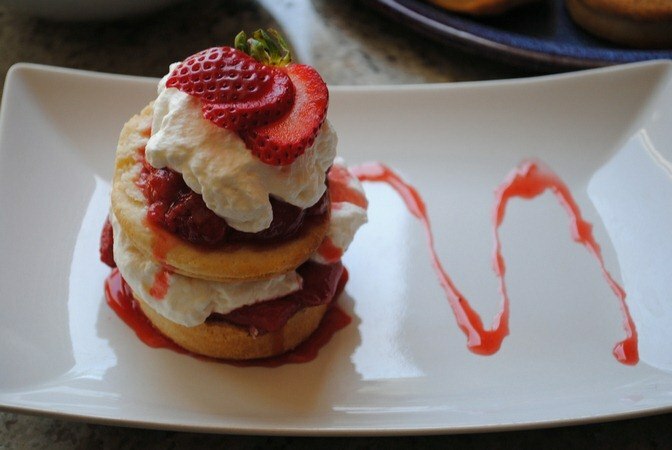 This is a fashioned dessert made from scratch strawberry shortcake. Mix one cup sugar and strawberries in a bowl and let it stand while you complete the rest steps. Stir occasionally to get it in juice form. Preheat oven to 175 degrees C (350 degrees F). Prepare an 8-inch greased round baking pan. Combine salt, baking powder, 2 tbsps. sugar, and flour in a bowl; cut in shortening with a pastry blender or knife till the mix resembles coarse crumbs. Stir into crumb mix with milk till just mixed; pour into the baking pan you prepared before. In the preheated oven, bake till you see a toothpick inserted into the center can come out clean, within fifteen to twenty minutes. Let it cool in a pan within about ten before removing shortcake. Split shortcake into 2 layers; use two tbsps. of softened butter to spread the bottom layer and top the dessert with juice and strawberries. Put top layer over strawberries. Prepare whipped cream to serve together with the dessert. This is the best yet simplest to make version of chocolate covered strawberries you would ever find in the world. 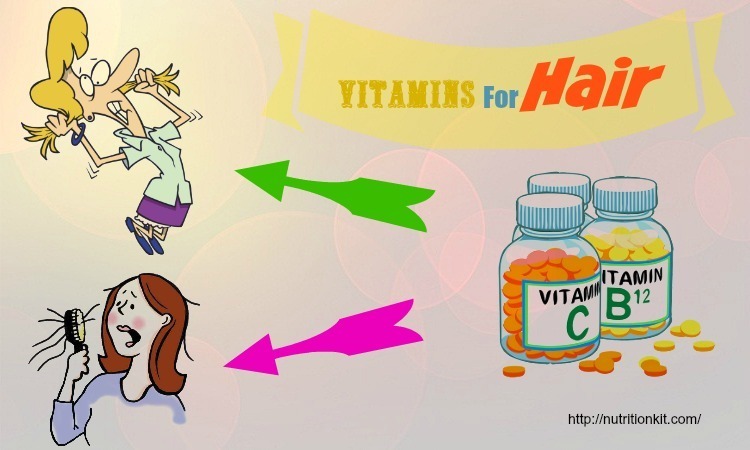 You can use paraffin to replace shortening. Turn the strawberries upside down and insert by toothpicks into a piece of styrofoam for easier cooling, or just put them on a wax paper’s sheet. White chocolate might be drizzled over the milk chocolate to get better looking dessert. 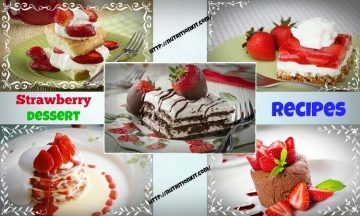 These beautiful cakes would be perfect for weddings when decorated with frosting bow ties, roses, butterflies, bells, etc. In a double boiler, melt the shortening and chocolate, stirring occasionally till smooth. 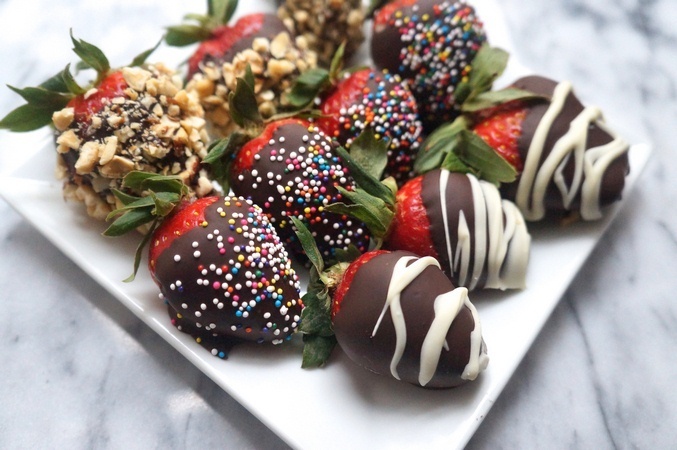 Hold them by the toothpicks and dip the prepared strawberries into the chocolate mix. Insert the toothpicks into the strawberries’ tops. Turn upside down the strawberries and insert the toothpick into styrofoam for the chocolate to cool. This scrumptious dessert would melt in your mouth! These tasty brownies with a surprise filling covered in sliced strawberries, whipped topping, and drizzled with chocolate. Yummy yummy!!!! Preheat oven to 175 degrees C (350 degrees F). Line 2 8-inch round cake pans with parchment paper or grease and flour them. According to package directions, prepare the brownie mixture, and pour batter into 2 eight-inch round cake pans. Bake as directed. Allow it to cool in a pan on a cooling rack. Run a knife around the cake pans’ outer edge, and tap out one of the rounds onto a serving-size plate. Spread over the top with ½ strawberry preserves. 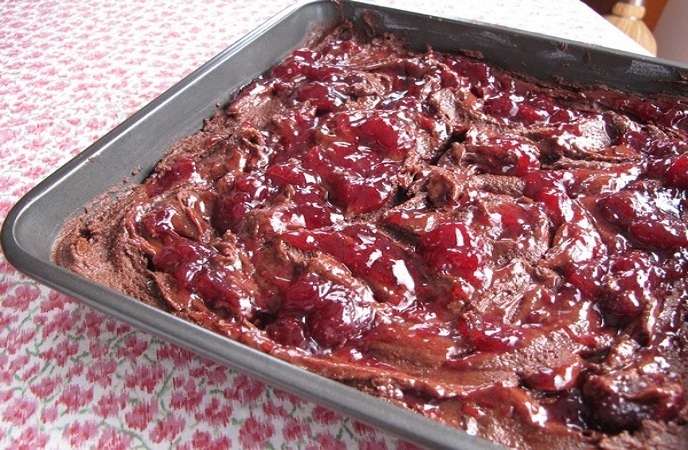 Put the 2nd brownie round on top, and spread the rest of the strawberry jam on it. Use whipped topping to frost the sides and top of the cake. 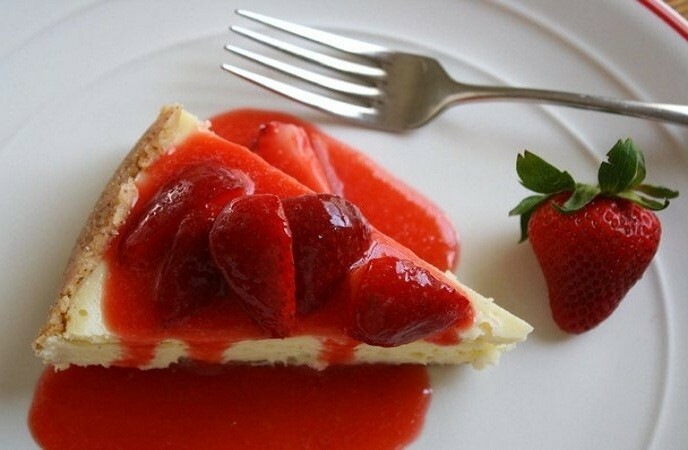 Put the sliced strawberries as a topping. Use chocolate syrup to drizzle the dish. Chill and taste it! This is my mom’s recipe; it is easy, quick to make, and delicious! Put into the fridge till serving. Use an electric mixer to beat cream cheese and whipped topping together in a bowl. Stir angel food cake pieces gentle into whipped topping mix; pour into a serving-size dish. 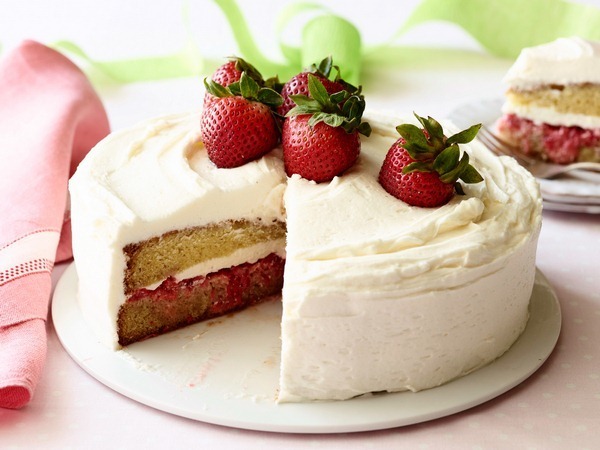 Stir sliced strawberries and strawberry glaze together in a bowl; spread over cake mix. Fun for the kids to make and enjoy! Strawberry gelatin and banana? You cannot go wrong with them! Mix boiling water and strawberry gelatin in a bowl till the gelatin has dissolved. Stir in cold water and put into the fridge till the gelatin becomes thick but not fully set up, within about fifteen minutes. Put about two tbsps. of thickened gelatin into each juice can’s bottom. Center a banana half, cut side down, into each juice can’s center and spoon the rest of the gelatin around the banana and fill the cans up to the top. Chill the cans till the gelatin turns firm, within two hours. 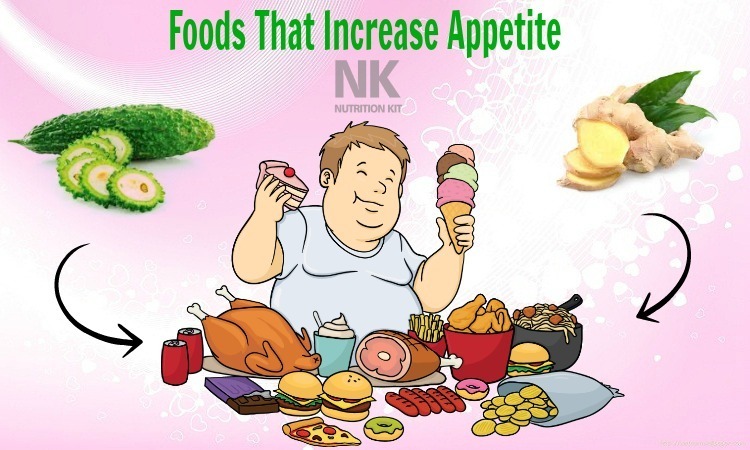 For serving, dip in hot water each can up to the rim to loosen the gelatin; invert the cans onto a serving-size plate and puncture the can’s bottom to let the air in. Lift the cans from the desserts and insert into the center of each dessert with a red licorice string to resemble a fuse. White chocolate with strawberries dipped in dark chocolate brings about an adorable dessert for Halloween. 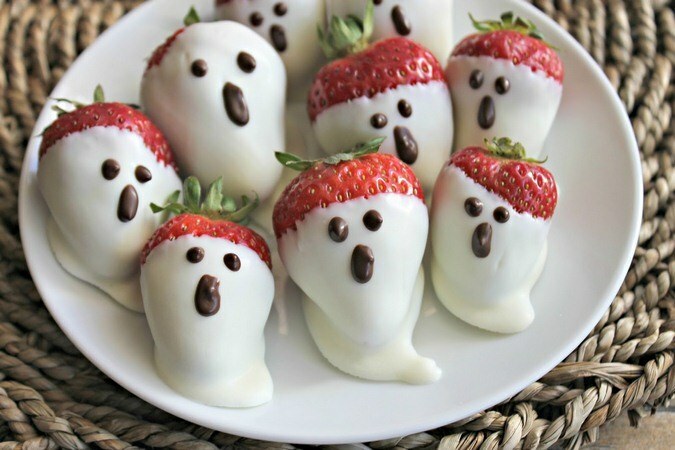 To make a ‘face’, open mouth and pipe eyes on the dried white chocolate dipped strawberries. Over simmering water, melt semisweet chocolate chips on top of a double boiler. To avoid scorching, use a rubber spatula, stirring regularly and scraping down the sides. Pour chocolate into a pastry bag with a small-size tip or a plastic bag with a small-size corner cut off. Dip the strawberries in melted white chocolate mix; arrange on a waxed paper-lined baking sheet and let it dry naturally. Over simmering water, melt coconut oil and white chocolate in the top of a double boiler. To avoid scorching, use a rubber spatula, stirring regularly and scraping down the sides. 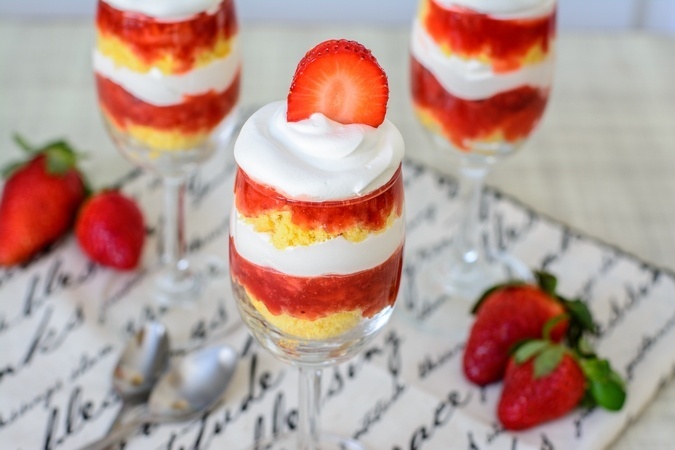 This is a tasty and light trifle that uses strawberry Jell-O to bring out the fruity flavor. Combine together cornstarch, sugar, and water in a saucepan; cook, stirring constantly, till the mix is boiling and thickened over medium-high heat, within five to ten minutes. Take out the saucepan from the stove and stir gelatin mix into sugar mix till dissolved. Set aside the strawberry glaze to let it cool. Layer ½ the strawberries in the glass bowl or trifle’s bottom. Drizzle ½ the strawberry glaze over the strawberry layer till coated evenly. 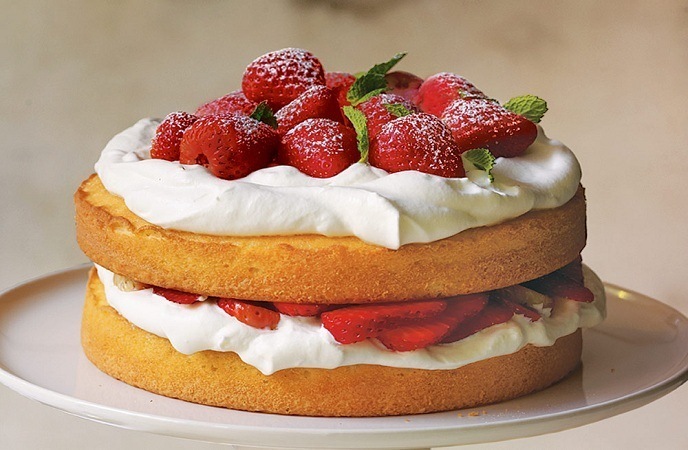 Over strawberry layer, spread ½ the whipped topping; Use pound cake to top. Layer over pound cake with the rest of the strawberries, whipped topping, and strawberry glaze respectively. If you are wondering how you can use big rhubarb plant in your garden? This would be the perfect suggestion for you! Preheat oven to 190 degrees C (375 degrees F). In a large-size bowl, mix rhubarb, 3 tbsps. flour, strawberries, and white sugar. Put the mix in a 13×9 inch baking dish. Mix oats, butter, brown sugar, and 1.5 cups flour till crumbly. You might want to use a pastry blender for this. Crumble on top of the strawberry and rhubarb mix. In the preheated oven, bake within 45 minutes or till lightly browned and crisp. Fresh strawberries in glaze crown a fluffy whipped topping/cream cheese filling in a graham cracker crust. Use a dollop of whipped topping or whipped cream to top each slice. Use an electric mixer, beat lemon juice, confectioners’ sugar, and cream cheese together on low speed of the mixer in a bowl. Add whipped topping and beat till the filling is mixed well. Spoon into graham cracker crust with the filling. Stir glaze and strawberries together in a bowl till the berries are totally coated; arrange the berries over the pie filling. Put the pie into the fridge till chilled, within 60 minutes or more as needed. This is a Fresh chocolate and strawberries mousse, making an appealing treat for your sweet tooth. In a bowl, mix butter and crumbs to blend thoroughly. Evenly press onto a 9-inch spring-form pan’s bottom. Arrange around the pan side-by-side with the strawberry halves, pointed the ends up, with cut sides against the pan’s side; set aside. Put chocolate chips into a blender container. Pour corn syrup and water into a small-size saucepan. Bring to a boil and allow the dessert to be simmered within 60 seconds. Our over chocolate chips and blend immediately till smooth. Pour into a mixing bowl and let it cool naturally on its own. While cooling the chocolate, whip 1.5 cups of the cream to see the stiff peaks formed. Use a large whisk or a rubber spatula to fold 1/3 of the whipped cream into the cooled chocolate for lighter form and flavor. Gently fold in the rest of whipped cream till the mix is blended thoroughly. Transfer the mousse into the pan you prepared before and smooth the top. 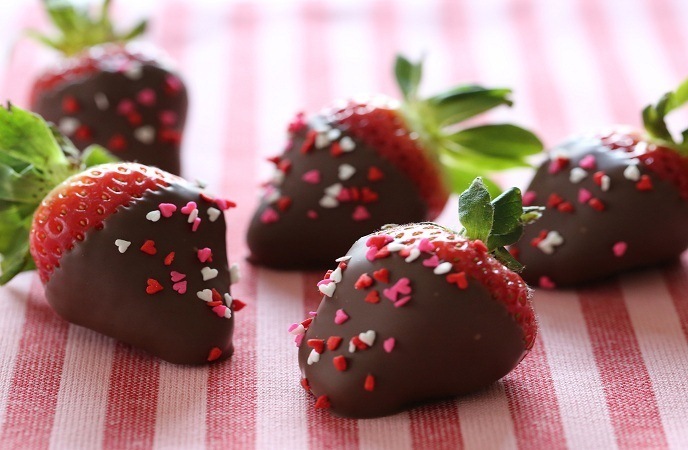 The strawberries’ points may extend about the chocolate mix. Use a plastic wrap to cover and put it into the fridge for 4 to 24 hours. In a medium-size mixing bowl, beat the rest half cup of cream to get soft peaks formed up to two hours before serving. Stir in sugar. Beat till the stiff peaks are formed. Remove the spring-form pan’s side and put the cake on a serving-size plate. Dollop or pipe whipped cream onto the cake’s top. 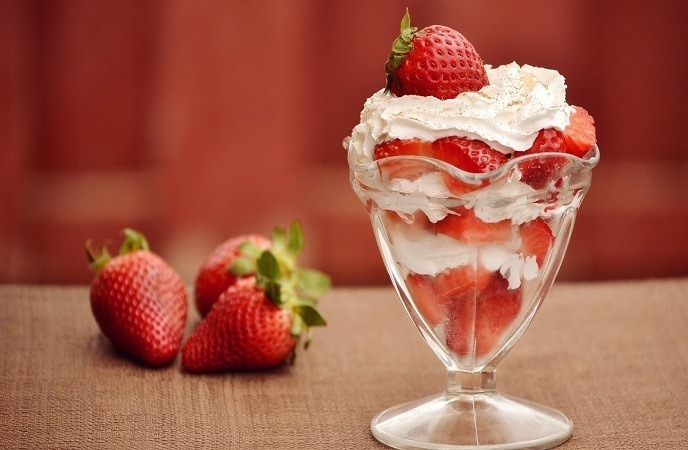 Arrange the rest halved strawberries on whipped cream. To serve, use a thin knife to cut into wedges, wiping blade between the cuts. 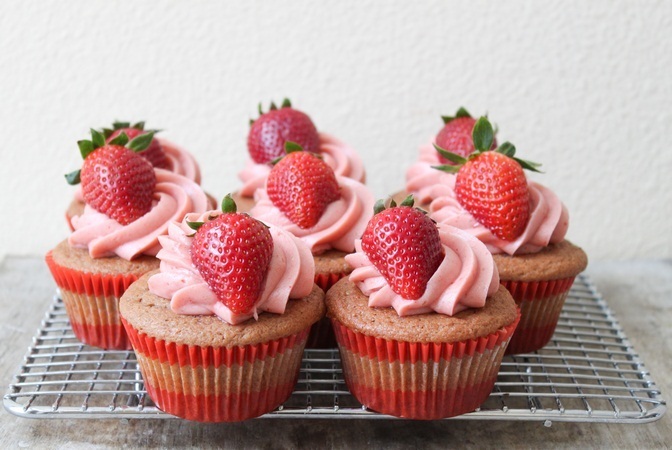 These strawberry cupcakes would be enjoyed by your friends and family members if you give them, and will beg you for more! Moist, light, and airy – they look wonderful with a pink and white swirl of frosting on top! Preheat oven to 175 degrees C (350 degrees F). Line with paper liners or grease 12 muffin cups. Stir baking soda, sugar, and flour together in a large-size bowl; make a well in the center. Add vanilla extract, strawberry preserves, mayonnaise, water, mayonnaise, and water to the well and mix till the batter is just mixed. Spoon the batter into the muffin cups you prepared before. Press one strawberry into each. In the preheated oven, bake till the tops spring back when pressed, within about twenty to twenty five minutes. This is an awesome restaurant-style strawberry topping. 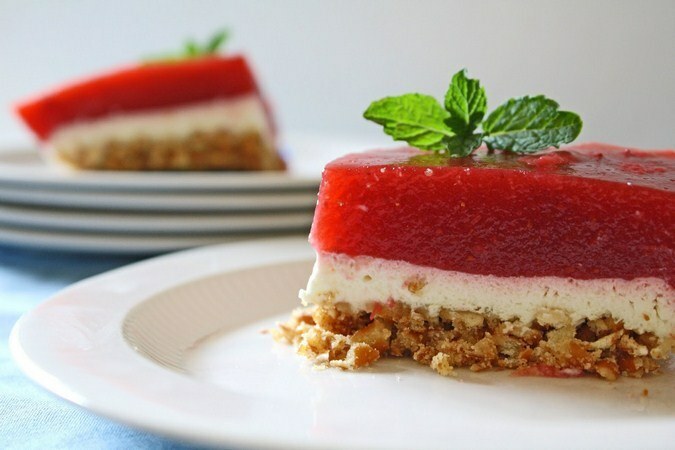 You should prepare ice cream or cheesecake to serve together with this delicious dessert! Remove stems and wash strawberries; cut large berries in half or chop them roughly. Combine vanilla, sugar, and strawberries in a saucepan. Over medium-high heat, cook and stir occasionally. The mix would sizzle for a while, but then the juice would start to form. Continue to stir; mash some strawberries using a heat-proof spatula or a wooden spoon to help produce the syrup. Cook till the sauce thickens, within fifteen minutes. Turn off the heat. In a blender, puree about 1/3 of the sauce, and then mix back into the rest of the topping. Store in the fridge. This is a dessert-type muffin that may disappear in minutes. Preheat oven to 190 degrees C (375 degrees F). line 12 muffin cups with paper muffin liners or grease them. Beat together confectioners’ sugar and cream cheese till smooth; set aside. In a large-size mixing bowl, mix salt, baking powder, and all-purpose flour together. In another bowl, beat together vanilla extract, lemon zest, butter, brown sugar, and egg milk. Stir the egg mix into dry ingredients, stirring just till all ingredients are moistened. Spoon ½ the batter into the muffin cups. Top each portion with 1 tsp. jam and 1 tbsp. cream cheese mix. Spoon the rest of the muffin batter to top. In the preheated oven, bake within twenty minutes, or till golden. Cool in pan within five minutes, and then take out the muffins and allow them to cool down on rack. Put into an airtight container to store. This is a wonderful, simple to make pie recipe that could be made with any frozen juice for unique flavor. You can use additional whipped topping to top the pie if you want. In a large-size bowl, mix whipped topping, sweetened condensed milk, and daiquiri mix. Mix till the combination turns creamy and smooth. Add thawed strawberries and blend into the mix. Fill pie crusts and put into the fridge for about four hours or freeze till set. This is such a good looking dessert or snack. It is a lovely addition to the buffet table and is among the very first things to go. Whisk pudding mixture and milk together in a bowl till thickened and smooth, within two minutes. Fold in coconut extract and whipped topping. Put into the fridge. From top to bottom, use a straw to poke a hole in each strawberry. Transfer the pudding mix to a piping bag fitted with a star tip. Use a fingertip to cover the bottom hole of a strawberry, and then use the pudding mix to fill the strawberry. Put into the fridge before serving. If you try any one out on the list of strawberry dessert recipes we reveal in the article today, then you will be doing your health and appearance a favor and giving them a brand new version. 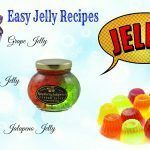 After all, what you should do is simply to try making those delicious desserts to light up your family’s meals every day! 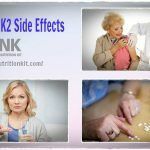 If you have anything to ask about the content of this article, feel free to leave all your comments on the section below!